Monday 31st August 2015 – 5.45pm – John Hawker. A man has been trapped in the car he was driving following a serious RTC in Shropshire this afternoon. The crash occurred on the B4371, Hilltop, near the Wenlock Edge Inn at around 12.40pm. Two ambulances, a paramedic officer and the Air Ambulance Team in a rapid response vehicle attended the scene. A West Midlands Ambulance Service spokesman said: “Crews arrived to find a car and a 4×4 vehicle that had been in a collision, with both vehicles suffering front end damage. “The driver of the car, a man believed to be 21 years old, suffered serious leg injuries and suspected back injuries in the crash. Medics treated the man whilst he was trapped in the car and he was given pain relief. “With the assistance of the fire service the man was safely removed from the vehicle and received further treatment at the scene. He was trapped for around one hour. “The man was then transferred by land ambulance to Royal Shrewsbury Hospital for further emergency treatment. “The passenger in the car, a girl believed to be 18 years’ old suffered minor injuries in the crash including chest and abdominal pain. She received treatment from medics and was also transferred to the same hospital for further treatment. “The occupants of the 4×4 vehicle, a man and a woman, were both checked over at the scene after suffering bumps and bruises but did not require further treatment and were discharged. Monday 31st August 2015 – 9am – Jamie Arrowsmith. 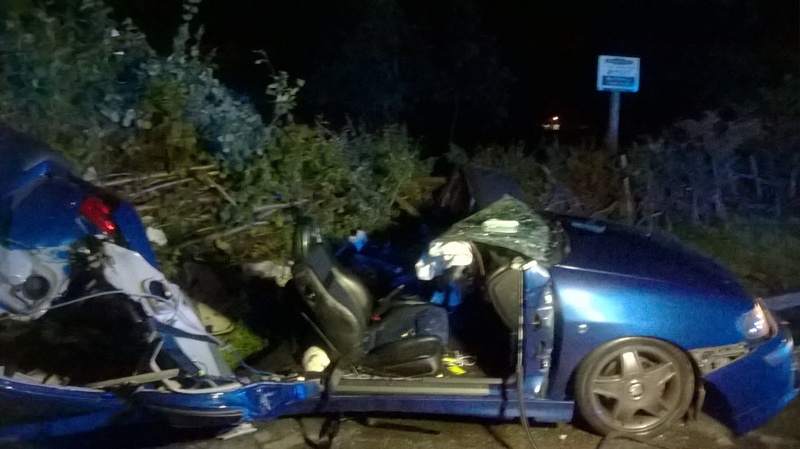 Two men have been treated for serious injuries after their car collided with a tree near Pershore last night (Sunday). West Midlands Ambulance Service was called to the A44 between Peopleton and Drakes Broughton, near to Stonebow Farm, just before 10.50pm and sent two ambulances, a senior paramedic officer, a MERIT trauma doctor and the Trust’s Hazardous Area Response Team to the scene. 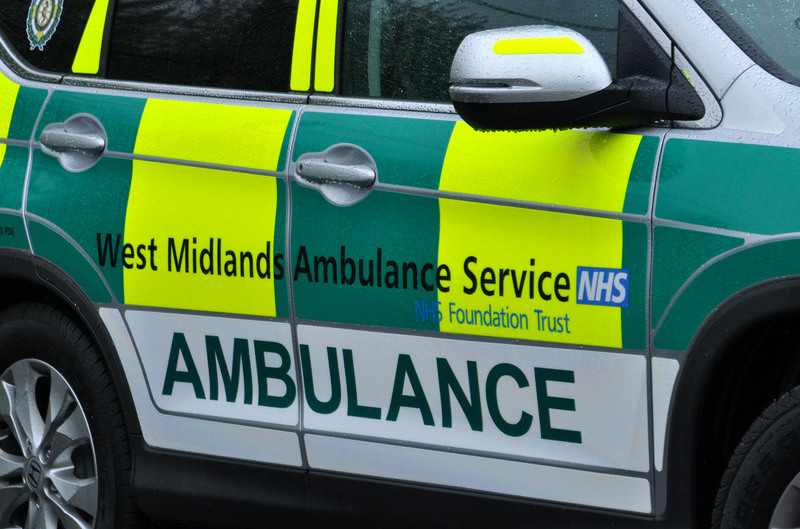 A West Midlands Ambulance Service spokesman said: “Crews arrived to discover two patients in a serious condition and lying on top of each other in their car which had collided with a tree. The car had come to rest facing the wrong way on the carriageway. “The fire service were also in attendance and removed the roof of the car in order for ambulance staff to be fully able to access the patients. “One of the patients, a man in his 20s, was treated for a serious head injury and a reduced level of consciousness. In order to stabilise his condition he was anaesthetised by the doctor at scene and transported to Queen Elizabeth Hospital Birmingham. Sunday 30th August 2015 – 10.40pm – Jamie Arrowsmith. 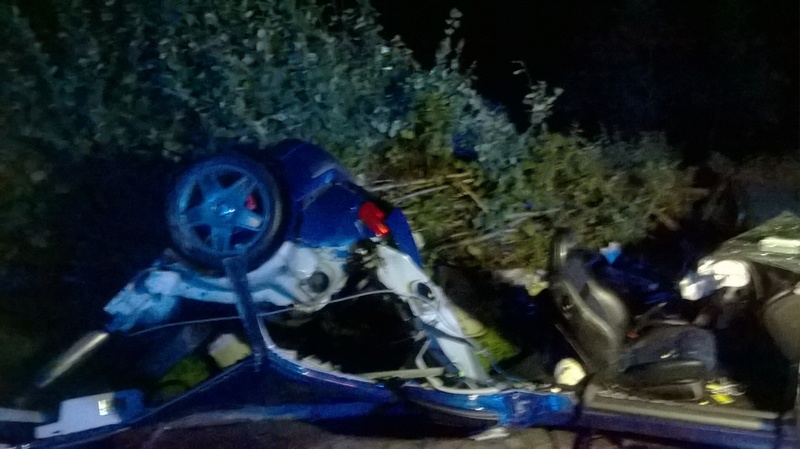 Four teenagers have been fortunate to escape serious injury when the car they were travelling in came to rest on its roof following a collision with street furniture near Brierley Hill this evening. West Midlands Ambulance Service was called to Brierley Hill Road in Wordsley at 6.55pm and sent three ambulances, a paramedic area support officer, a rapid response paramedic and a MERIT trauma doctor to the scene. A West Midlands Ambulance Service spokesman said: “We received seven 999 calls about this particular road traffic collision and on arrival, crews discovered a car which had come to rest on its roof after it is believed to have collided with street furniture. “There were four patients, all of whom had managed to free themselves from the vehicle. “The most seriously injured patient was a 17-year-old woman who was treated by ambulance staff for a nasty cut to her forehead. She was then taken to Russells Hall Hospital. “The remaining three patients, two 19-year-old men and another 17-year-old woman all escaped with minor injuries. “They were also taken to Russells Hall as a precaution. Sunday 30th August 2015 – 6.30pm – Jamie Arrowsmith. A teenager has been treated for multiple injuries and cut free from her car after it left the road, rolled and came to rest in a hedge near Ludlow this afternoon. West Midlands Ambulance Service was called to the incident on the A4113 in Bromfield just before 1.30pm and sent an ambulance, a paramedic area support officer and a community paramedic to the scene. A West Midlands Ambulance Service spokesman said: “On arrival, crews discovered a car in a hedge which they were told had rolled and come to rest on all four wheels after leaving the road. It is not believed any other vehicles were involved. “The driver, a 19-year-old female, was the sole occupant in the car and was trapped inside the vehicle as a result of the incident. “Following an initial assessment, ambulance crews worked alongside the fire service to free her from the car, a process which involved cutting the roof off the vehicle and took approximately 45 minutes. “She was treated for injuries to her arm, neck and back and immobilised with the use of a neck collar and spinal board. Saturday 29th August 2015 – 2.30pm – Jamie Arrowsmith. 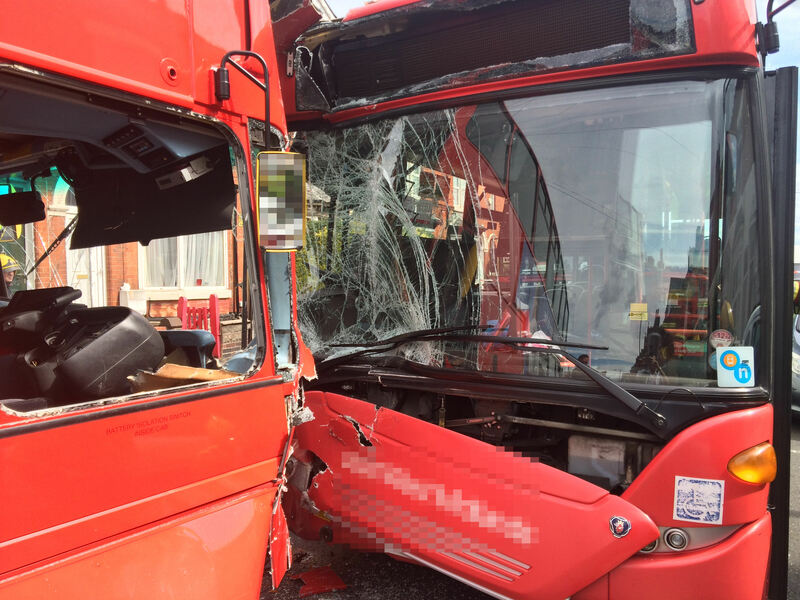 Two bus drivers, who had to be cut free from their cabs, and four other passengers have been treated by ambulance crews and taken to hospital following a collision between a single decker and double decker bus in Birmingham this morning. In total, 13 patients were assessed by West Midlands Ambulance Service, seven of whom were discharged on scene. The incident occurred on Addison Road shortly after 11am. Five ambulances, a paramedic area support officer, a doctor, the Trust’s Hazardous Area Response Team (HART) and the Midlands Air Ambulance from Cosford were sent to the scene. 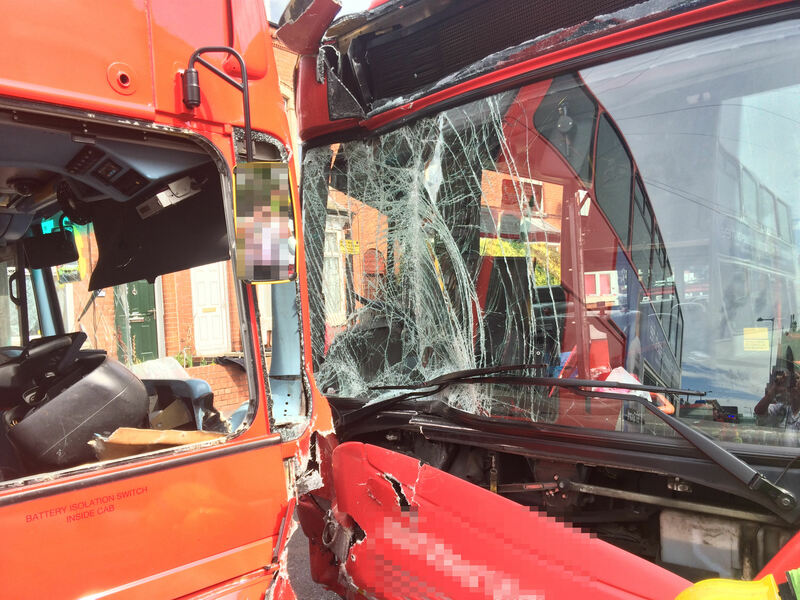 A West Midlands Ambulance Service spokesman said: “Crews arrived on scene to discover two buses that had been in collision with the front driver’s side of both vehicles having suffered significant damage. “It quickly became evident that both drivers were trapped as a result of the incident and ambulance staff worked closely with the fire service to free them, a process which took approximately 90 minutes. 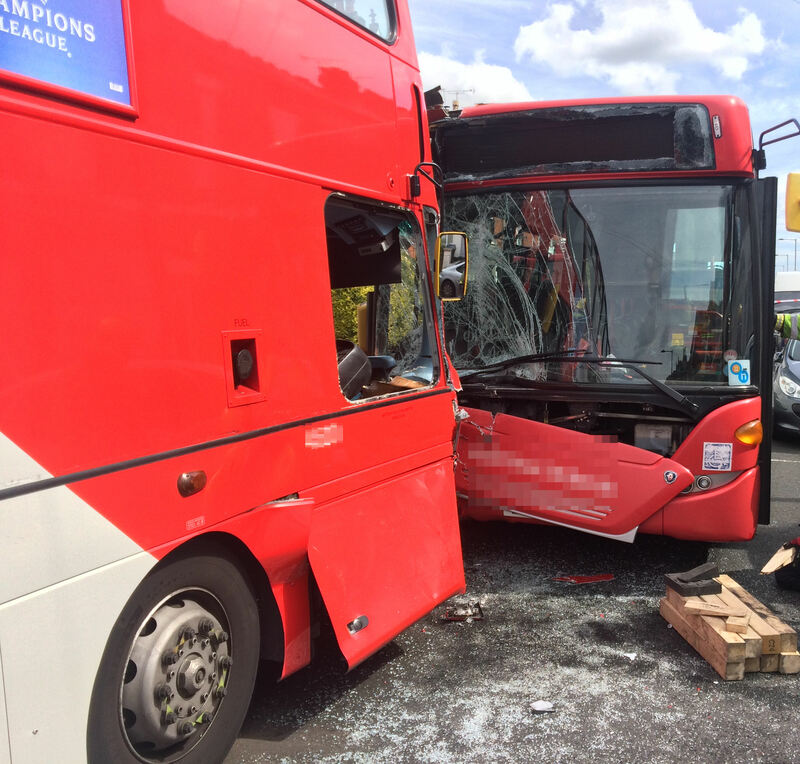 “The fire service’s technical rescue team had to manoeuvre the double decker bus backwards before carefully cutting part of the side of both vehicles away. “The driver of the single decker bus, a man believed to be in his 40s, was treated by ambulance staff for leg injuries and once freed, was taken to Queen Elizabeth Hospital Birmingham. “The driver of the double decker bus, a man thought to be in his 40s, was also treated for leg injuries and again taken to Queen Elizabeth Hospital Birmingham. “Both men appear to have escaped serious injuries which given the significance of the collision is extremely fortunate. “One of the passengers on the single decker bus, an elderly female, had to be helped from the vehicle on a stretcher. She was treated for back injuries and taken to the same hospital. 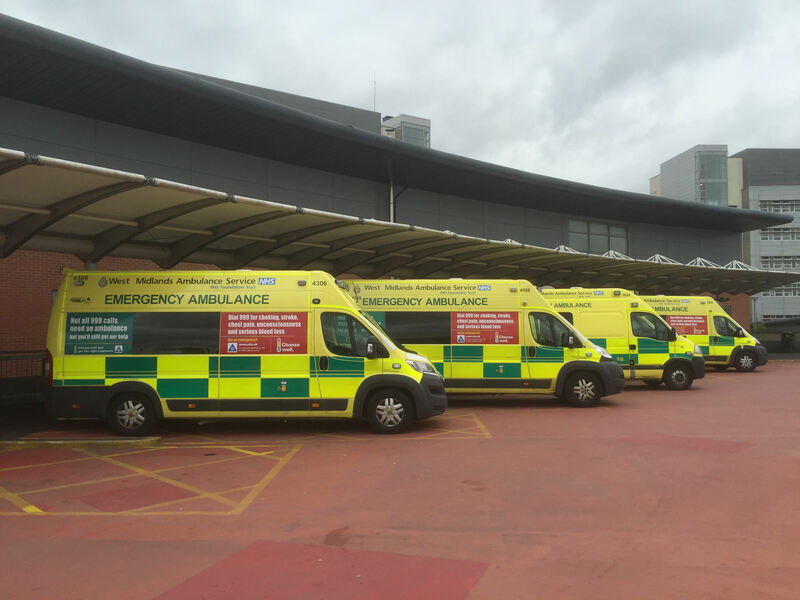 “A further ten patients were assessed and triaged at the scene by HART, of which three required further assistance and onward travel to Queen Elizabeth Hospital Birmingham. 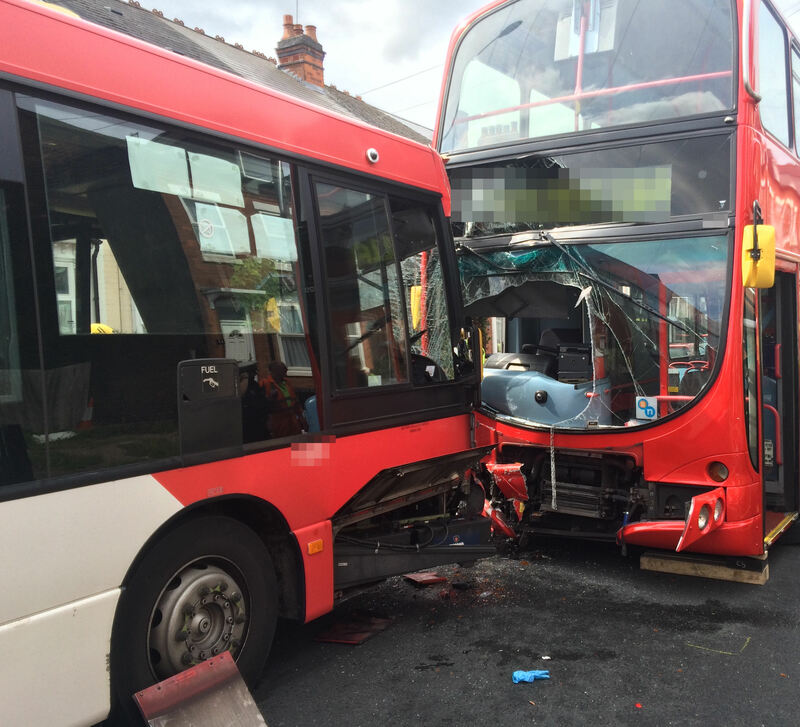 “A man from the single decker bus was treated for elbow, shoulder and knee injuries, whilst two females, one of whom was elderly, were treated for minor injuries. “All six patients who were taken to hospital were done so by land ambulance. Saturday 29th August 2015 – 8.20am – Jamie Arrowsmith. 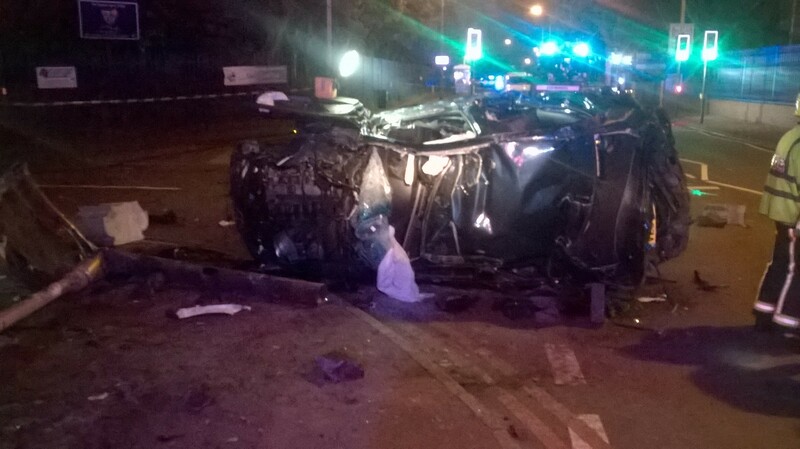 Two people had to be cut free from their car and helped out through the roof following a two-car road traffic collision in Birmingham in the early hours of this morning. West Midlands Ambulance Service was called to Newtown Middleway just before 1.15am and sent three ambulances and a paramedic area support officer to the scene. A West Midlands Ambulance Service spokesman said: “On arrival at the scene, ambulance staff discovered two cars that had been in collision, both of which had suffered significant damage. “One of the cars had suffered significant front end damage and had two patients inside, both of whom were trapped as a result of the incident. “The driver of the car, a woman in her 40s, was treated for injuries to her neck, chest and ankle. She was immobilised with the use of a neck collar and spinal board. “The passenger, a woman in her 50s, had suffered neck, chest and knee injuries and was also immobilised with the use of a neck collar and spinal board. “Both remained conscious throughout and were administered pain relief whilst ambulance staff worked closely with the fire service to carefully free them from the car, eventually getting them out through the roof. It took approximately 25 minutes to free them both from the car. “They were then both taken to City Hospital for further assessment and treatment. “From the second car, which suffered serious damage all over the vehicle, a man in his 30s was treated for a minor shoulder injury and discharged on scene. Saturday 29th August 2015 – 7.50am – Jamie Arrowsmith. One man has died following a road traffic collision between a car and a pedestrian in Stourport in the early hours of this morning. West Midlands Ambulance Service was called to Hillary Road shortly after 4am and sent an ambulance, a paramedic area support officer and a community paramedic to the scene. A West Midlands Ambulance Service spokesman said: “Ambulance staff arrived to find a man who had been in collision with a car. Sadly, it quickly became apparent that nothing could be done to save the man and he was confirmed dead at the scene. Saturday 29th August 2015 – 7.25am – Jamie Arrowsmith. 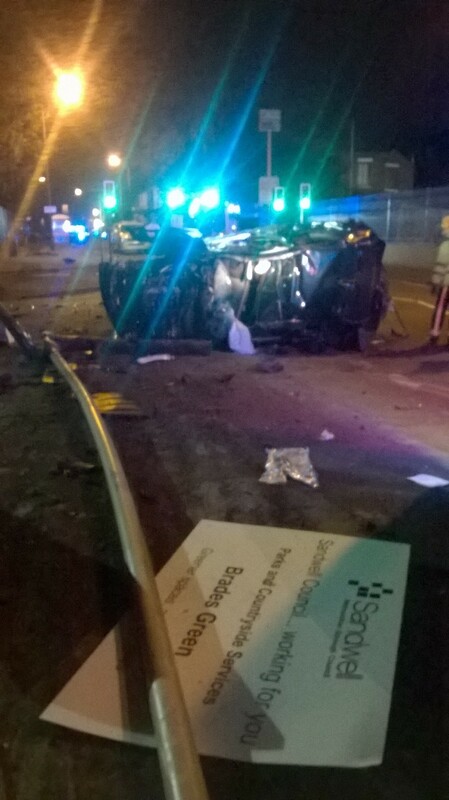 One man has died and another has been seriously injured after they were both ejected from their vehicle in a road traffic collision in Birmingham last night. 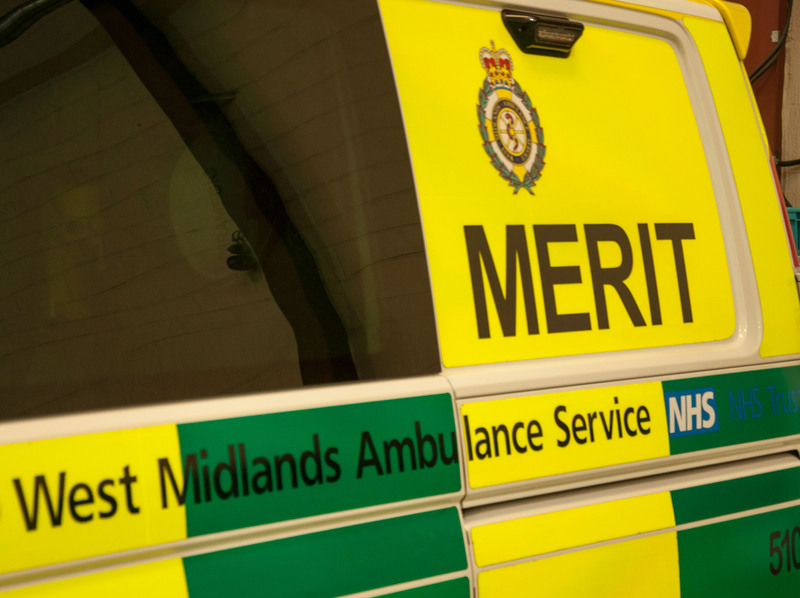 West Midlands Ambulance Service was called to Small Heath Highway, Birmingham, shortly after 11.25pm and sent three ambulances, a paramedic area support officer and a MERIT trauma doctor to the scene. A West Midlands Ambulance Service spokesman said: “Ambulance staff arrived to find four patients in total, two of whom were men who had been ejected from their vehicle. “The men had been ejected when the car they were travelling in rolled and come to rest the right way up, on the opposite side of the carriageway. 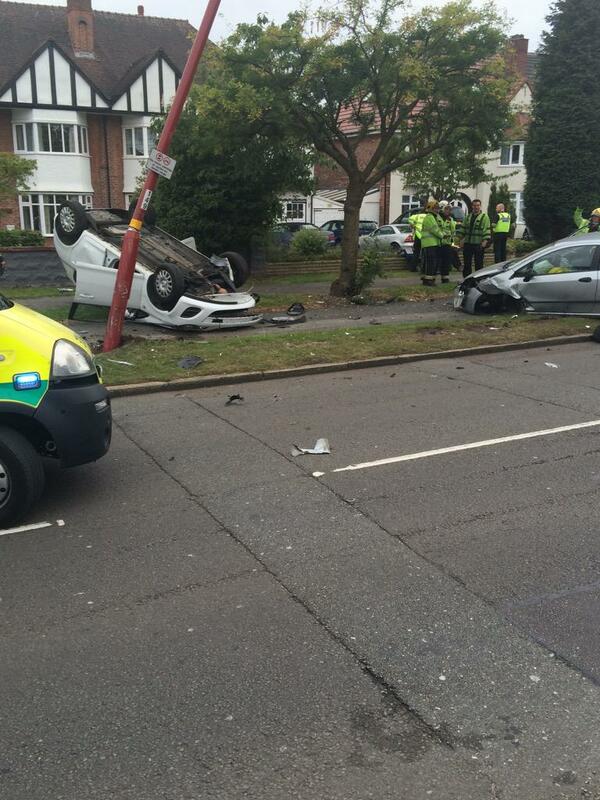 The car had collided with the central reservation and a lamppost in the incident. “Bystanders were already carrying out CPR on one of the men prior to our arrival. Ambulance crews then took over and began administering advanced life support but unfortunately it quickly became apparent nothing could be done to save the man and he was confirmed dead at the scene. “The second man, believed to be in his 50s, was also in cardiac arrest. Again crews carried out advanced life support and were successfully able to restart the man’s heart. “He had suffered a significant head injury in the incident and was quickly transferred to Queen Elizabeth Hospital Birmingham. “Unfortunately his injuries are thought to be extremely serious. “The two other patients, both men in their 20s, had suffered minor injuries. One was treated for a minor pelvic injury and immobilised as a precaution. Friday 28th August 2015 – 10.40pm – Jamie Arrowsmith. A man who sustained electrical burns when the ladder he was carrying collided with an overhead power cable has been airlifted to hospital earlier today. West Midlands Ambulance Service was called to a country lane in Highwood, Tenbury Wells, just off the B4204 shortly before 4.55pm and sent an ambulance, a community first responder and the Midlands Air Ambulance from Strensham to the scene. A West Midlands Ambulance Service spokesman said: “When ambulance staff arrived they found a man in his 50s who had suffered electrical burns when the ladder he was carrying collided with an overhead power cable. “The man had suffered full thickness burns to his hands and exit burns to his feet. “Ambulance crews treated the man’s burns with cooling dressings and administered pain relief in order to stabilise his condition. Friday 28th August 2015 – 4.35pm – Chris Kowalik. A mountain biker found fallen by a passerby on a roadside in Worcestershire has been airlifted to hospital in Birmingham. West Midlands Ambulance Service was called to Lower Wyche near Earnslaw Quarry shortly after 10.40am today. A rapid response vehicle, an ambulance crew and the Midlands Air Ambulance from Strensham attended and landed on a nearby common. A West Midlands Ambulance Service spokesman said: “The man who is in his sixties, had a serious head injury. Thursday 27th August 2015 – 5.25pm – Claire Brown. 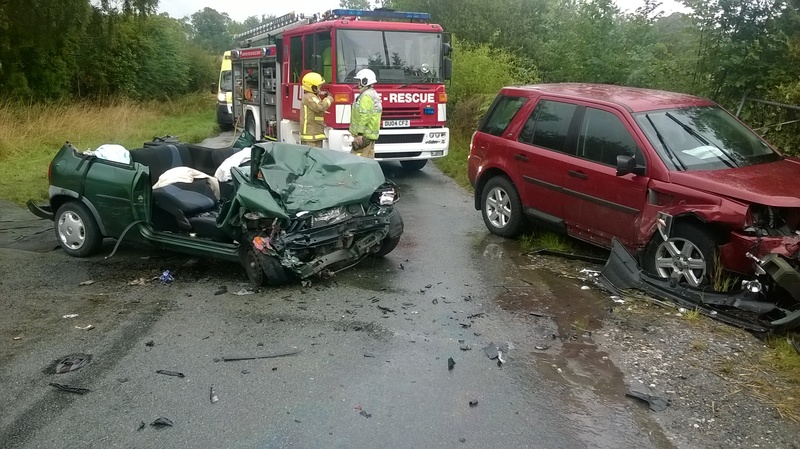 A three car collision in Oswestry has left a family of four in hospital this afternoon. 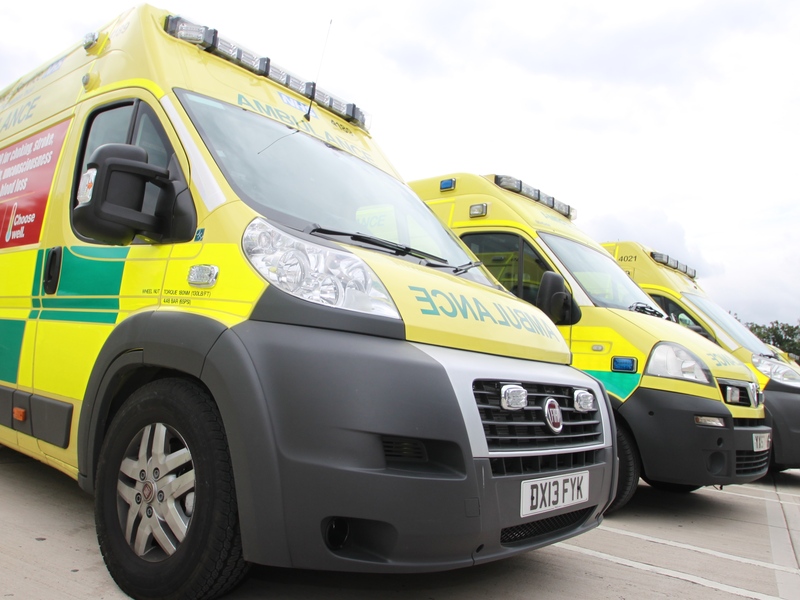 West Midlands Ambulance Service was called to the A483 just before 3.00pm (Thursday). Three ambulances, a paramedic area support officer and the Midlands Air Ambulance from Cosford with a MERIT trauma doctor on board attended the scene. A West Midlands Ambulance Service spokeswoman said: “The damage caused to one car in the collision had left a 70cm indent in the side of the vehicle leaving one rear seat passenger trapped inside. The 14-year-old girl, who sustained a facial injury, had to be extricated from the car with help from the fire service. Once released from the car ambulance staff were able to further assess and treat her injuries before she was taken by land ambulance to Royal Shrewsbury Hospital. “The other three occupants, the teenage girls’ relatives, had managed to get out of the car prior to our arrival. A man in his 50s had chest pain together with pain in his back and hip. Ambulance staff and the medic administered pain relief to the man to help stabilise his condition before he was carefully immobilised with a neck collar and spinal board. 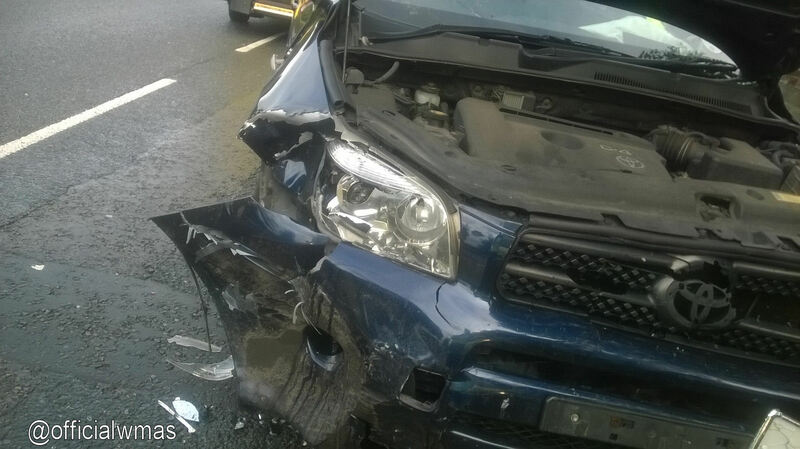 Due to the damage caused to the drivers’ side in the collision and the nature of his injuries, the man was airlifted to Royal Stoke University Hospital for further trauma treatment. “The other two passengers, a teenage boy and a woman were assessed on scene. The boy was found to have sustained a minor chest injury and was taken to Royal Shrewsbury Hospital. The woman, whilst uninjured, travelled in the ambulance to hospital to be with her family members. Wednesday 26th August 2015 – 6.45pm – Jamie Arrowsmith. 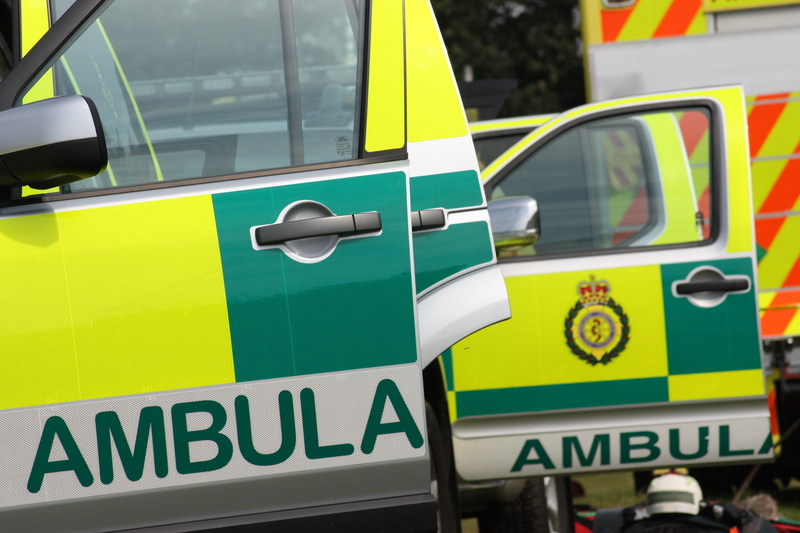 One man has died and three others have been taken to hospital following a collision between a car and two vans near Shrewsbury this afternoon. 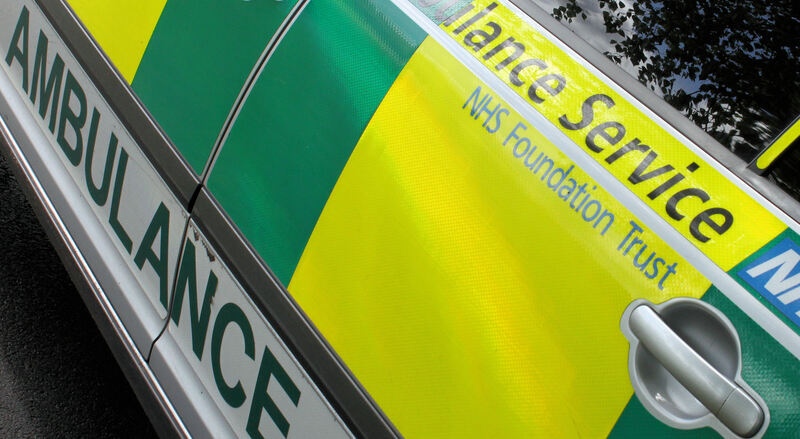 West Midlands Ambulance Service was called to the incident near to Hardwick Motor Services on the A49 just north of Hadnall, shortly after 3.15pm. Two ambulances, a paramedic area support officer and a rapid response paramedic attended the scene. A West Midlands Ambulance Service spokesman said: “On arrival, crews discovered a car and two vans that had been involved in a significant collision. “Unfortunately, it quickly became apparent that nothing could be done to save the driver of the car, a man, and he was confirmed dead at the scene. “There were two further patients in one of the vans, a man and a woman, both thought to be in their 60s. “The woman was treated for neck and back pain and immobilised with the use of a neck collar and spinal board. The man had suffered arm injuries. They were both transported to Royal Shrewsbury Hospital by the same ambulance. “From the second van, a man in his 20s was treated for neck and back pain. He was also immobilised with the use of a neck collar and spinal board before being taken to the same hospital. Wednesday 26th August 2015 – 8.00am – John Hawker. 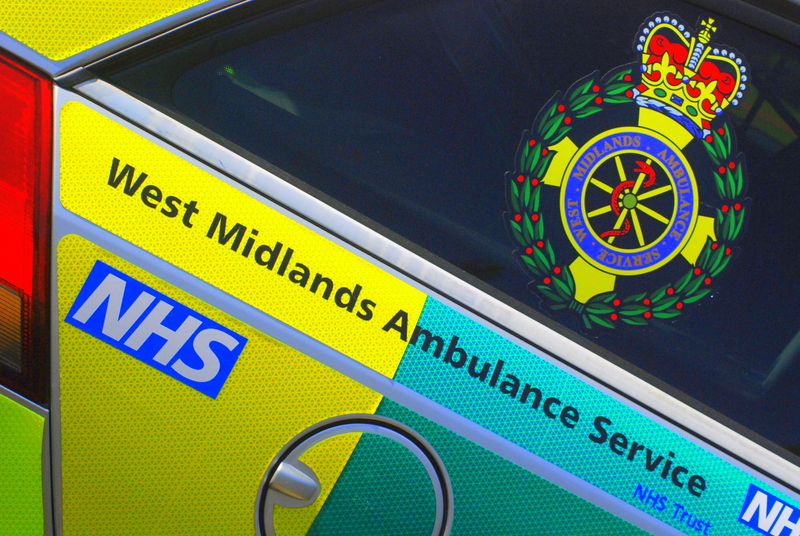 A young child has died following an RTC in Birmingham last night. The incident occurred on Nelson Road, Aston at around 6.50pm. Two ambulances and a paramedic officer attended the scene. A West Midlands Ambulance Service spokesman said: “Crews arrived to find a young child that had been in collision with a car. “The boy had suffered serious injuries and was in traumatic cardiac arrest. “Advanced life support was carried out by medics at the scene, and resuscitation attempts continued on route to hospital, who had been pre alerted and were awaiting the child’s arrival. Notes to Editors: We never release ages of patients involved in fatal incidents. Wednesday 26th August 2015 – 7.40am – John Hawker. 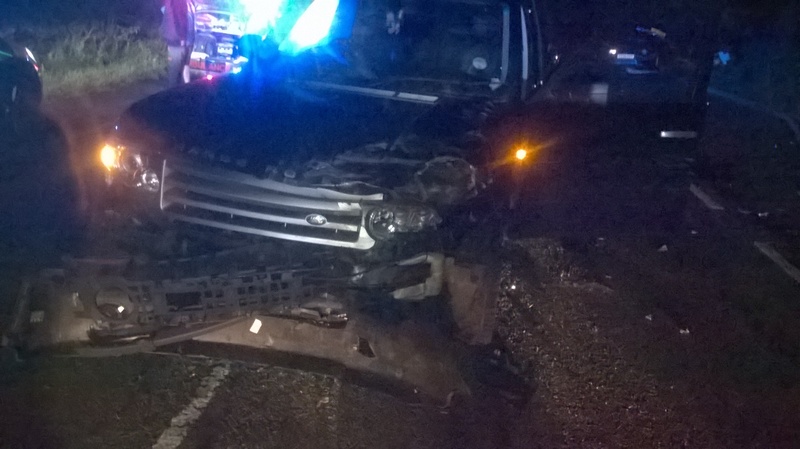 The occupants of a small car/van and a second car have been injured after a two vehicle crash in Telford last night. Ambulance crews responded to reports of the RTC on Madeley Road, Ironbridge at around 12.15am. Three ambulances and a paramedic officer attended. A West Midlands Ambulance Service spokesman said: “Crews arrived to two vehicles that had been in a serious collision. “Three teenagers found on scene had been travelling in the small car/van and suffered injuries. A 17 year old boy had suffered facial lacerations and a fractured lower leg. A 13 year old boy had suffered leg injury and also left sided pain. Both received emergency treatment at the scene from medics and were transferred by ambulances to Princess Royal Hospital for further treatment. “A third occupant of the small car/van, a 15 year old boy, was treated for minor injuries and bruises at the scene. He was discharged and did not require further treatment. Wednesday 26th August 2015 – 7.15am – John Hawker. Three people have been injured, one seriously following a crash in Shropshire last night where one car was ripped in half. The incident occurred on Gobowen Road, Oswestry at around 10.10pm. Two ambulances, a rapid response vehicle, a paramedic officer and the Trusts MERIT team were dispatched to the scene. A West Midlands Ambulance Service spokesman said: “Crews arrived to find two cars that had been in a significant collision. One of the cars had left the road and rolled over, with its roof and back end having been ripped off the vehicle. It came to rest the right way up on a grass verge. “A woman passenger in the badly damaged car received emergency treatment from medics whilst still in the vehicle. The woman in her 30’s had suffered serious chest injuries and suspected internal injuries. “The woman’s condition was stabilised and she was removed from the car with the assistance of the fire service. The woman was then transferred by ambulance to Royal Shrewsbury Hospital for further emergency treatment. “The driver of the car, a man believed to be in his 30’s, was treated at the scene by medics for concussion and a shoulder injury. The mans condition was stabilised and he was also transferred to the same hospital for further treatment. “The woman driving the second vehicle suffered minor injuries in the crash and received treatment from medics. The woman, believed to be in her early 40’s, did not require further treatment and was discharged at the scene. 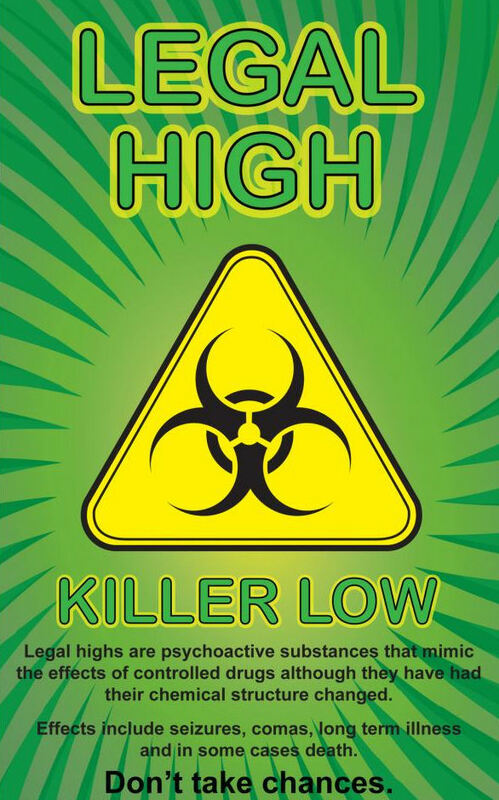 Legal highs – killer lows. Do you know what you are taking? Our staff see the aftereffects. Black Mamba, Pandora’s Box, Ivory Wave, Annihilation – they’re all legal highs but will they be killer lows as well? So called ‘legal highs’ are psychoactive substances that mimic the effects of controlled drugs although they have had their chemical structures changed. Whilst the attractions are clear, the downsides are less well known. Effects such as seizures, comas, long term illnesses and in some cases death! Still sound so attractive? Across the West Midlands, ambulance staff are now regularly having to deal with patients who have taken legal highs. Paramedic, Cameron McVittie said on his twitter account: “My last job of the night initially coded as a cardiac arrest…thankfully it wasn’t! But it was another case of ‘black mamba’…what is it? It is a legal high that is ‘synthetic cannabis’. It contains chemicals which mimic the effects of their illegal counterparts meaning the risks and side effects are similar. Fellow paramedic, Jack Lewis, added: “We some very poorly people who insist on taking legal highs. One of the sickest patients I’ve been to took a legal high. They may be “legal” but they are so dangerous. If you want advice on the pros and cons of using legal highs, check out Talk to Frank. You can follow Cameron on twitter here. See what Jack is up to here. 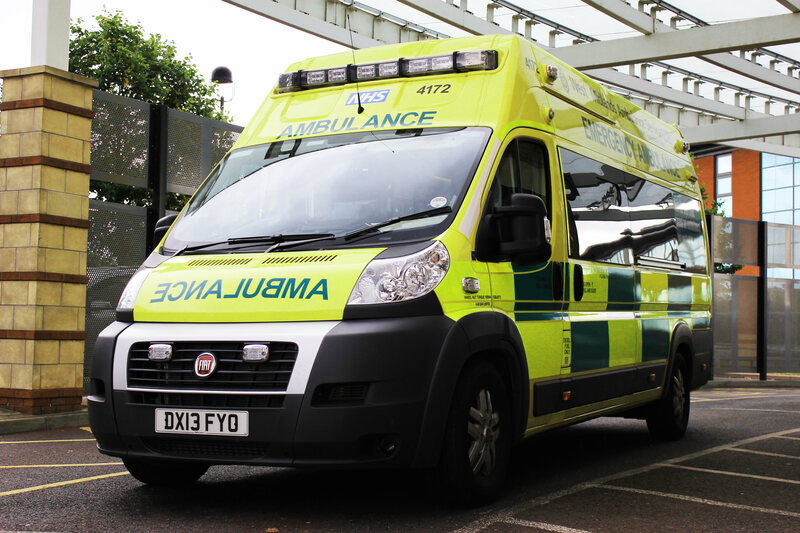 Ambulance Trusts across the country, including West Midlands Ambulance Service (WMAS), are the latest healthcare employers to gain government approval for developing new apprenticeship standards. The Trailblazers apprenticeship programme plays a key role in replacing complex apprenticeship frameworks with short, simple and accessible standards written and developed by employers. Prime Minister David Cameron recently announced the latest Trailblazer groups of leading employers within the healthcare sector. Ambulance Trusts have been working together to develop new apprenticeship standards with the aim of ensuring that every apprentice on a scheme can look forward to learning the necessary skills to pursue a career with the emergency services. Monday 24th August 2015 – 8.00am – John Hawker. 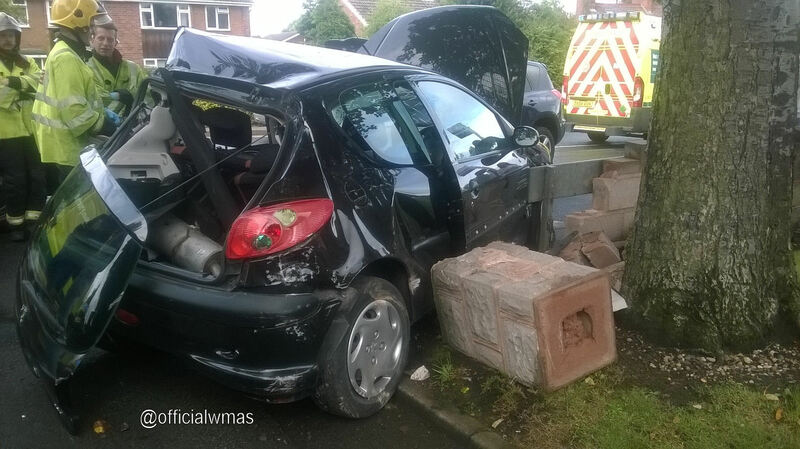 Four people have been fortunate to escape serious injury following an RTC in Walsall yesterday. 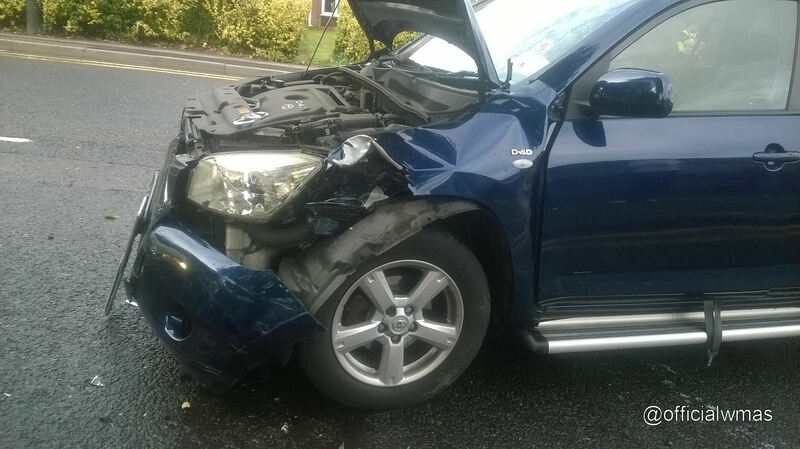 The crash occurred on Yew Tree Place, Bloxwich at around 4.20pm. Three ambulances and a paramedic officer attended the scene. A West Midlands Ambulance Service spokesman said: “Crews arrived to find two cars that had been in a significant collision. One vehicle had suffered substantial damage. “The driver of the badly damaged car, an 18 year old man, suffered neck pain, and an arm laceration. He received treatment at the scene from medics and was transferred to Walsall Manor Hospital for further treatment. Gladly there was no passenger travelling in this vehicle. “Three people travelling in the second car suffered multiple minor injuries. A woman in her 80’s and a second woman in her 40’s, both suffered chest pain. Both received treatment and were transferred to the same hospital. “The man travelling in the second vehicle, believed to be in his 60’s, declined treatment from paramedics. Monday 24th August 2015 – 7.30am – John Hawker. As of this morning, just over 1000 people have been treated by on-site medical staff at V Festival at Weston Park during the weekend. Since the gates opened, on-site ambulance crews have been called out 178 times and a total of 36 people have been taken off site to hospital. They include several people with suspected fractured ankles and lower leg injuries from trips and falls and also patients with medical complaints. The medical cover for the festival has been provided by a team of more than 300 staff and volunteers from West Midlands Ambulance Service, Venture Event Medical Management and St. John Ambulance. 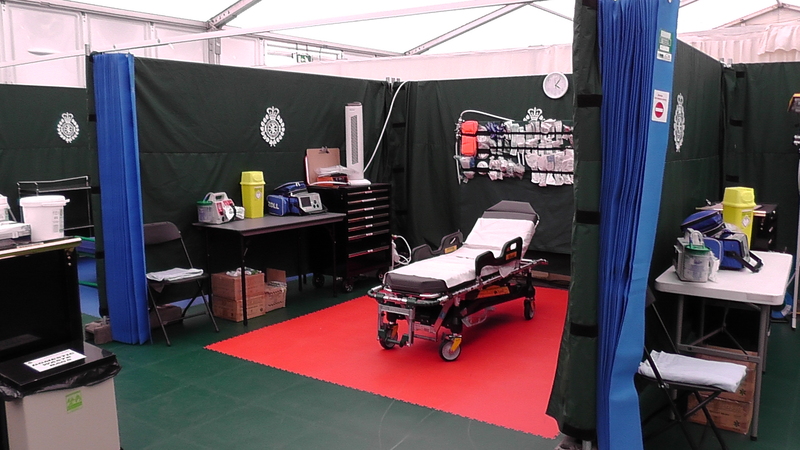 The team are operating a medical centre on site, along with a command and control centre which is co-ordinating ambulances and other medical staff who are stationed within the main arena and in the campsite areas. A West Midlands Ambulance Service spokesman said: “This year, many of the patients were treated for medical issues and medical staff also saw a number of people having been injured after suffering a fall around the site. “With tens of thousands of people all in one place, it’s always expected that some people will fall ill and require medical help. At Weston Park, the team of more than 300 staff and volunteers are on hand and have worked extremely hard to ensure every patient is given the very best treatment. The staff and volunteers will continue to remain on site all day today, until the last of the campers have left. Sunday 23rd August 2015 – 8.00pm – John Hawker. 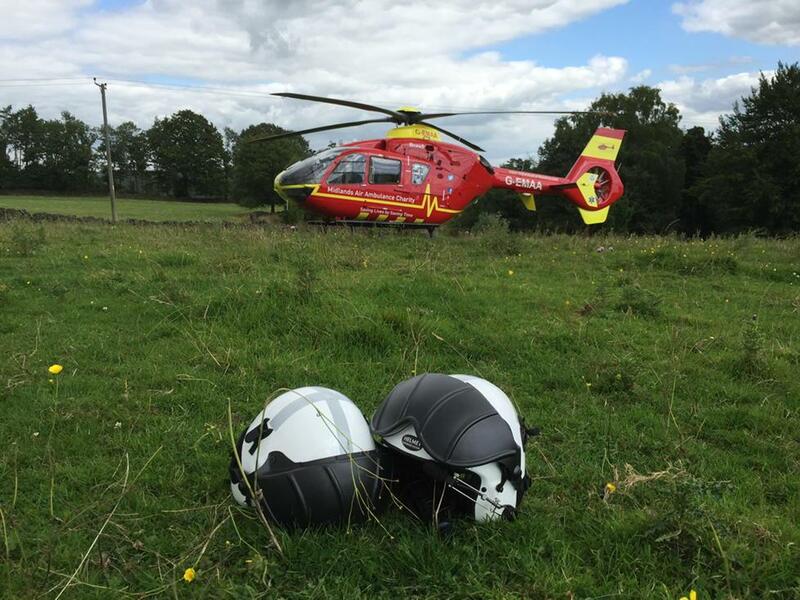 Two motorcyclists have been injured, one seriously following a crash in North Staffordshire this lunchtime. The crash occurred on the A523, opposite Rudyard Lake, near Rushton Spencer at around 12.25pm. An ambulance, a paramedic officer and the Midlands Air Ambulance from Staffordshire attended the scene. A West Midlands Ambulance Service spokesman said: “It is believed that four motorcyclists had been travelling together when two of them where in a serious collision. “One biker, a man believed to be 30 years old, was thrown from his machine around 20 feet from the road and was in collision with a stone gatepost and stone wall. “The man had suffered serious back and serious leg injuries. He received emergency treatment at the scene from medics including pain relief and the use of trauma splints. 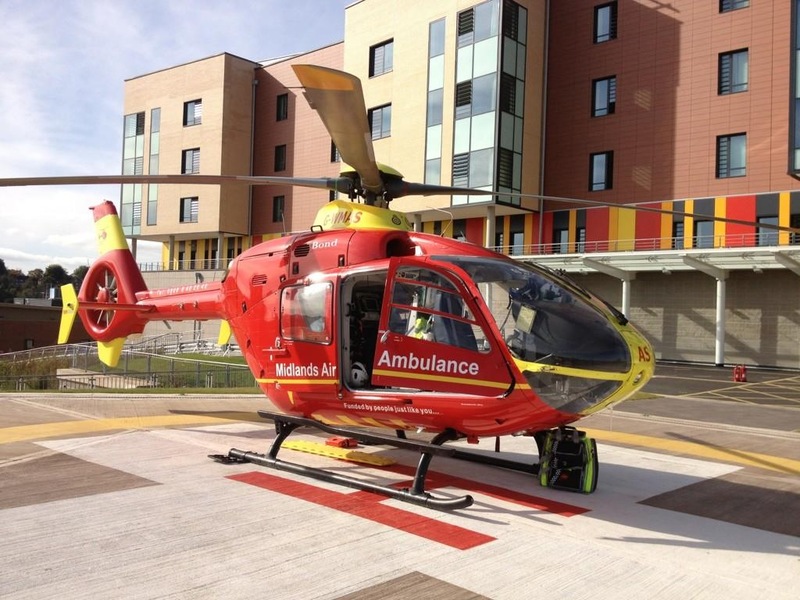 “Once the mans condition was stabilised, he was flown to Royal Stoke University Hospital for further emergency treatment. The man was wearing full motorcycle safety clothing which medics believe helped to prevent life threatening injuries. “A second man, travelling on a separate motorcycle, had also become separated from his machine and suffered serious gravel rash to his posterior, legs, and arm. “He also received emergency treatment at the scene from medics and was transferred by land ambulance to the same hospital for further treatment. “Unfortunately this biker appeared to be wearing normal clothing and not motorcycle safety clothing. Sunday 23rd August 2015 – 9.30am – John Hawker. 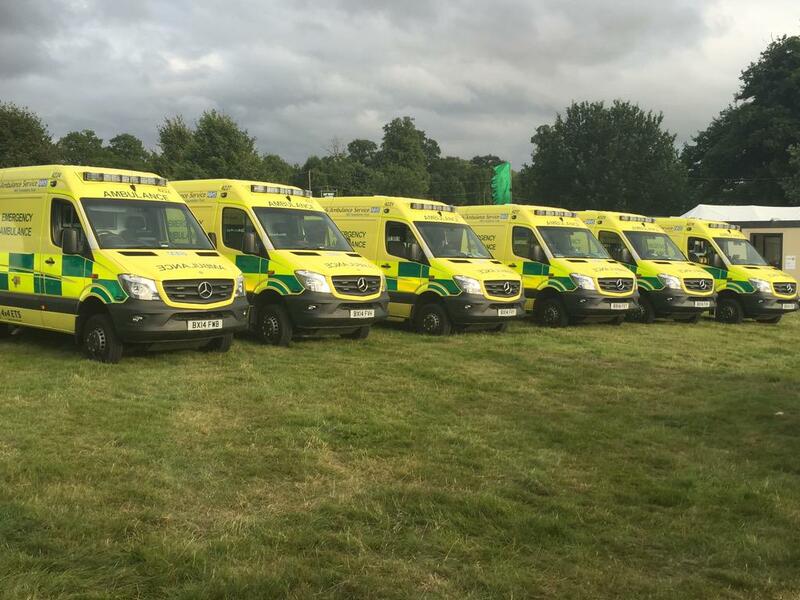 West Midlands Ambulance Service continues to provide medical cover at this year’s V Festival at Weston Park in partnership with Venture Event Medical Management and St. John Ambulance. The organisations are operating a medical centre at Weston Park and since the gates opened, staff have treated 611 self-presenting patients, with on-site ambulance crews have been called out 86 times (57 medical cases and 29 trauma cases). A total of 22 people have been taken to hospital, they include people who have suffered injuries after falling over and subsequently suffered suspected lower leg fractures. Several patients with pre-existing medical conditions were also treated that required further treatment at hospital. A West Midlands Ambulance Service spokeswoman said: “Doctors, nurses, paramedics, technicians, managers, first aiders, control room staff and logistics staff are on hand to make sure that if you are unfortunate enough to fall ill or get injured, help won’t be far away. “In most cases, a trip to hospital isn’t required and revellers are able to continue enjoying the event. So far, the majority of the patients have been treated for medical issues, many already had pre-existing medical conditions but crews have also seen a number of alcohol related cases. “There was lots of rain overnight which meant medical staff saw an increase in the number of injuries suffered from people falling over. The weather is looking a lot better at the moment and we hope this will continue for the rest of the festival. Sunday 23rd August 2015 – 6.30am – John Hawker. A man has died following a fire in a flat in Coventry last night. Saturday 22nd August 2015 – 8.55pm – John Hawker. 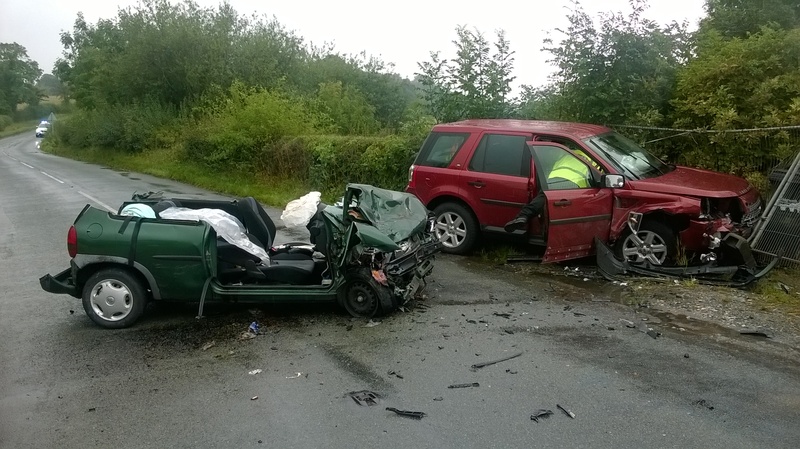 Four people have been injured, one seriously following an RTC in Warwickshire earlier today. The crash occurred on the A46, in a small tunnel just before Longbridge Island at around 4.30pm. Two ambulances, a paramedic officer and the Midlands Air Ambulance from Strensham attended the scene. A West Midlands Ambulance Service spokesman said: “A car was found at the scene that had rolled over and come to rest on its roof. “All four occupants of the car had managed to get out of the vehicle, even though one woman had suffered serious injuries. “The woman, believed to be in her late 50’s, suffered serious arm injuries and also pain to her back, neck and abdomen. She received emergency treatment at the scene by medics and her condition was stabilised. “She was then transferred by land ambulance to University Hospital Coventry and Warwickshire for further treatment. “The three other people travelling in the car, a woman and two children suffered multiple minor injuries in the crash and were treated at the scene. All three were transferred to Warwick hospital for further checks and treatment. Saturday 22nd August 2015 – 7.30pm – John Hawker. A pedestrian was given trauma care at the scene of an RTC today in Solihull. The incident occurred on Warwick Road at around 12.15pm. A rapid response paramedic, an ambulance, a paramedic officer and the Warwickshire and Northamptonshire Air Ambulance attended the scene. 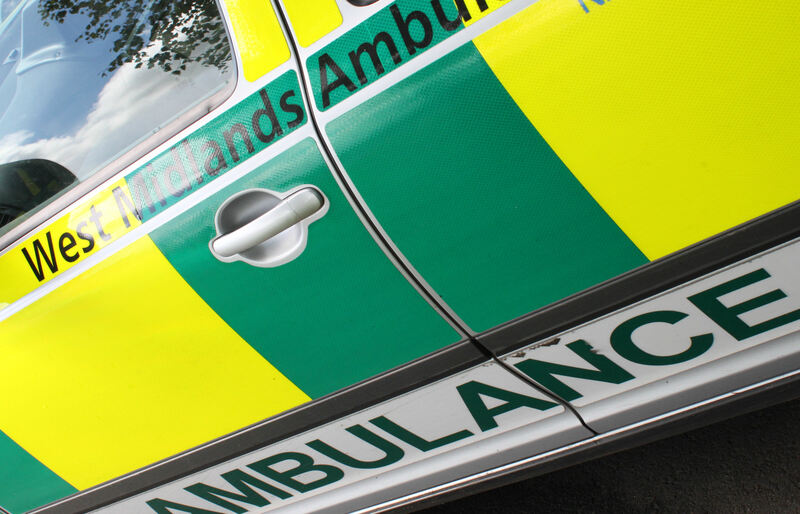 A West Midlands Ambulance Service spokesman said: “Crews arrived to find an elderly man that had been struck by a car and was lying in the road. “The man, believed to be in his 60’s, suffered serious head, leg and suspected pelvic injuries. “Medics carried out trauma care at the scene with the trauma Doctor anaethetising the patient due to his serious injuries. “The man was then transferred by land ambulance to Queen Elizabeth Hospital Major Trauma Unit for further emergency treatment. Two men have died after the car they were travelling in crashed in Stoke on Trent this morning. The incident occurred on the A500 Southbound, around 200 hundred metres past Bashford Roundabout at around 4.50am. Two ambulances, a paramedic officer and a BASICS Doctor attended the scene. A West Midlands Ambulance Service spokesman said: “Crews arrived to find a car that had suffered extensive damage following an RTC. “Unfortunately, it quickly became apparent that nothing could be done to save two men that were in the car, and sadly they were both confirmed dead at the scene. Saturday 22nd August 2015 – 8.20am – John Hawker. 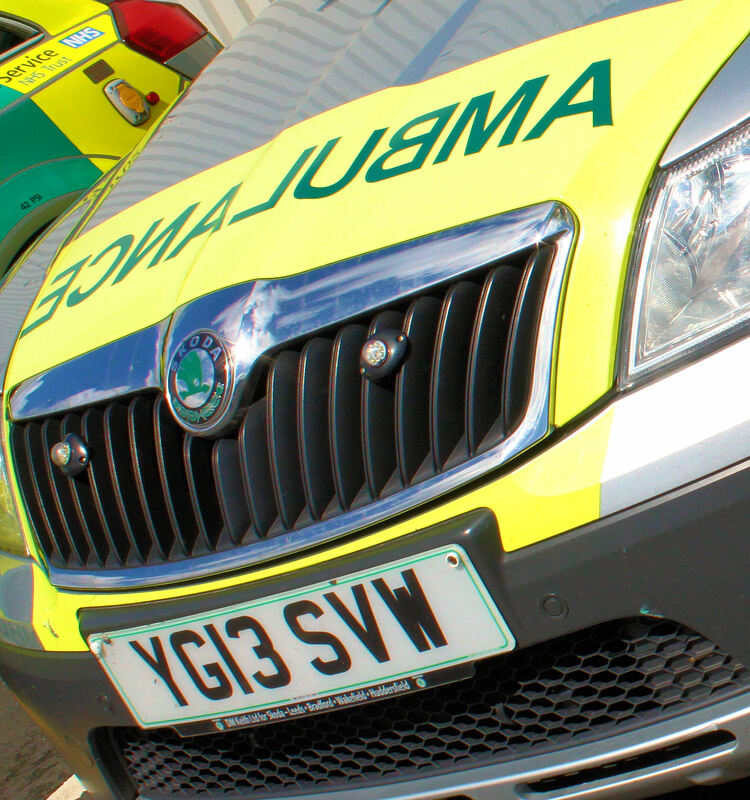 A motorcyclist has been seriously injured after a crash in Birmingham last night. The incident occurred on Tile Cross Road, Kitts Green at around 5.20pm. An ambulance, a paramedic officer and the Midlands Air Ambulance from Cosford attended the scene. A West Midlands Ambulance Service spokesman said: “Crews arrived to find a motorcycle that had been in collision with a car. “The man riding the motorcycle had suffered serious leg, arm and suspected pelvic injuries in the crash. “The man, believed to be in his mid 20’s, received emergency treatment at the scene from medics using trauma splints and also received pain relief. “After the bikers condition was stabilised, he was transferred by land ambulance to Queen Elizabeth Hospital Major Trauma Unit for further emergency treatment. Saturday 22nd August 2015 – 7.00am – John Hawker. 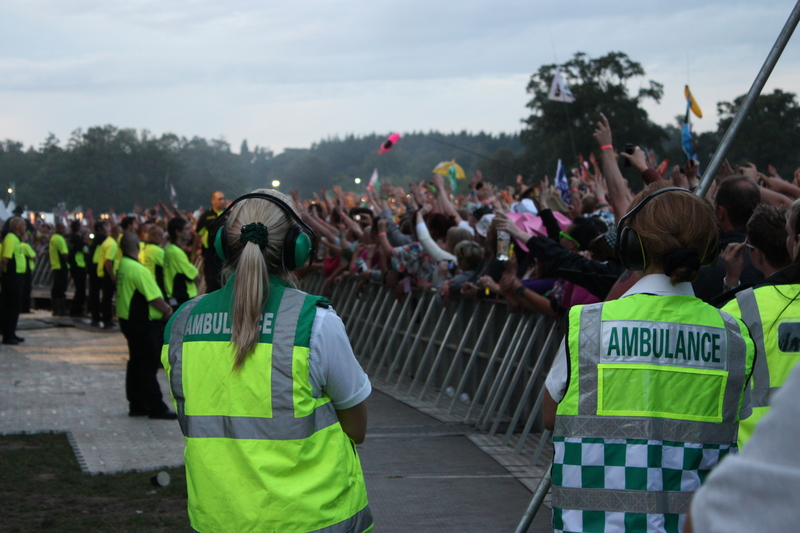 West Midlands Ambulance Service, in partnership with Venture Event Medical Management and St. John Ambulance, is providing medical cover at this year’s V Festival at Weston Park. 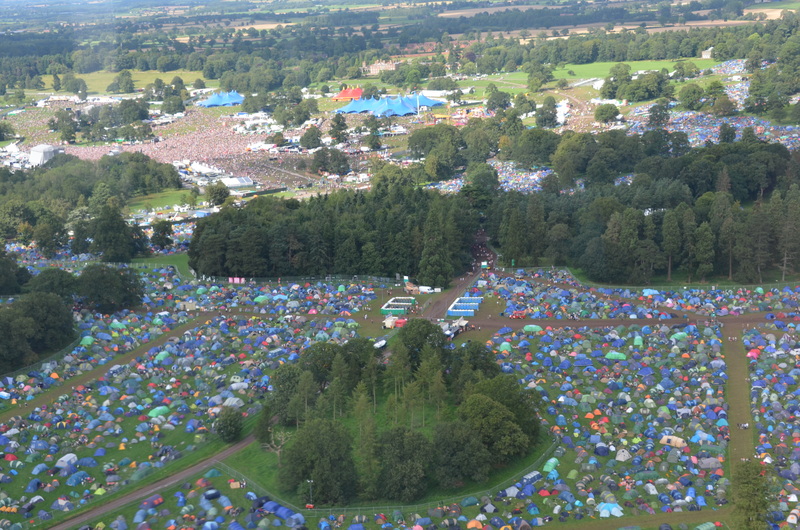 The organisations’ staff and volunteers, of which there are more than 300, are operating a medical centre on site, along with a command and control centre which is co-ordinating ambulances and other medical staff who are stationed within the main arena and in the campsite areas. They will be on hand to assess and treat anyone who should become ill or injured during the weekend, providing first-class medical services onsite for the thousands of festival goers, making it one of the safest festivals in the country. A West Midlands Ambulance Service spokesman said: “It’s been a steady start for the staff and volunteers since the gates opened to campers on Friday. “So far, 132 people have been treated at the on-site medical centre collectively by St. John Ambulance volunteers and West Midlands Ambulance Service staff after self-presenting to the facility. On-site ambulance crews around Weston Park tended to a further 36 patients with only three patients requiring hospital treatment. This included a patient with an ear injury and also a second patient with a suspected fractured ankle. “Fortunately, the vast majority of cases were minor injuries, including trips, bumps and falls and a number of people having suffered a wasp or bee sting. Friday 21st August 2015 – 8.15pm – John Hawker. A quad biker was thrown from his machine after being in collision with a car in Coventry this evening. The incident occurred on Clifton Street at around 6.05pm. An ambulance, a paramedic officer and a BASICS Doctor attended the scene. A West Midlands Ambulance Service spokesman said: “Crews arrived to find a quad bike and a car that had been in a collision. “The man riding the quad bike had been thrown from his machine and suffered serious leg injuries and minor facial injuries. “The man, believed to 29 years old, received emergency treatment at the scene from medics, including pain relief and being immobilised with a spinal board and neck collar. 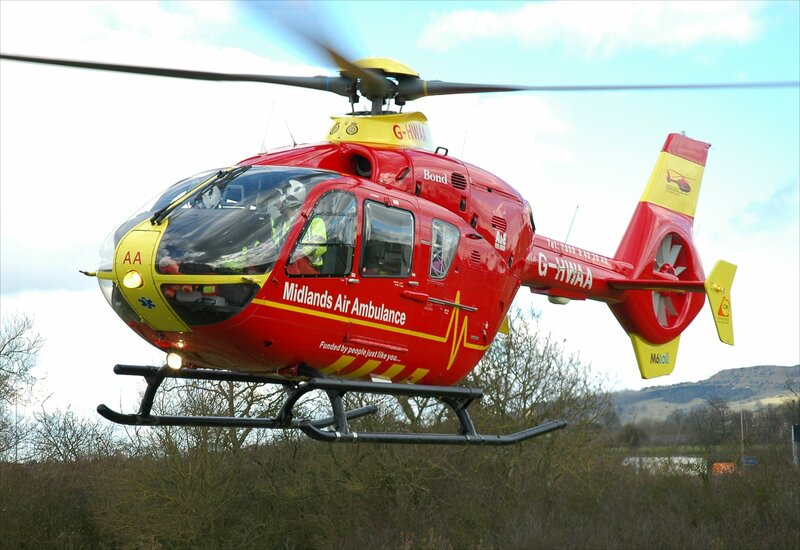 “After his condition was stabilised, the man was transferred by land ambulance to University Hospital Coventry and Warwickshire for further treatment. Thursday 20th August 2015 – 11pm – Jamie Arrowsmith. A car driver has been treated for multiple injuries after his vehicle collided with a tree and was left buried in bushes following a two-car collision in Birmingham tonight. West Midlands Ambulance Service was called to the incident near to Pump Island, Dartmouth Circus, just off the Aston Expressway, shortly before 8.55pm and sent an ambulance, a rapid response paramedic and a paramedic area support officer to the scene. A West Midlands Ambulance Service spokesman said: “Crews arrived to find two cars that had been in collision, one of which had suffered significant front end damage and come to rest in some bushes following a collision with a tree. “The driver of the car, a man in his 20s, had been helped from the vehicle by passers-by prior to the arrival of ambulance staff and was breathing and conscious throughout. “He was treated for a fractured right leg and pelvis injuries. He was immobilised with the use of a pelvic splint and given pain relief before being taken to Queen Elizabeth Hospital Birmingham on alert. “The passenger, also a man in his 20s, was assessed at scene but did not require further treatment. Wednesday 19th August 2015 – 5.20pm – Jamie Arrowsmith. A teenage horse rider has been airlifted to hospital after being thrown from her mount in Warwickshire this afternoon. West Midlands Ambulance Service was called to a field near to Five Ways Road in Wroxall, shortly after 12.45pm and sent an ambulance and the Midlands Air Ambulance from Strensham to the scene. A West Midlands Ambulance Service spokesman said: “On arrival, crews discovered a female teenager who had been thrown backwards off her mount. The horse subsequently, fell backwards on to the patient. “She was treated for a suspected fractured pelvis and injuries to her ribs. She was immobilised and given pain relief before being airlifted to University Hospital Coventry and Warwickshire for further treatment. Wednesday 19th August 2015 – 10.43am – Murray MacGregor. Ambulance bosses in the West Midlands say a new report on the level of abuse suffered by ambulance staff in the North East is sadly no surprise. 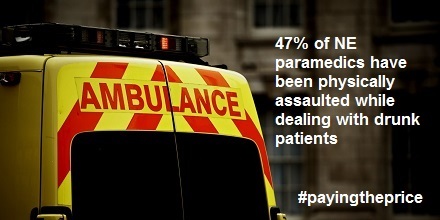 Two-thirds of paramedics stated that they felt at risk of physical assault when working in the night time economy. 90% of staff have been threatened by an intoxicated person at least once. Almost half of staff said they had been threatened six or more times. 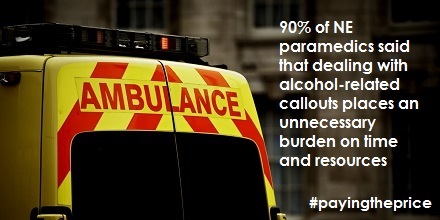 3 in 5 paramedics say they shouldn’t have to deal with the consequences of alcohol misuse. Over 90% of NEAS paramedics feel that dealing with alcohol-related callouts places an unnecessary burden on their time and resources. Two-thirds of paramedics said alcohol-related incidences accounted for at least half of their workload during weekend evenings. Steve Elliker, the WMAS’s Regional Head of Security and Safety, said: “It is completely unacceptable that ambulance staff should have to face violence, verbal or sexual abuse. “Sadly, violence against our staff is something that happens every week. Very often there is a link between alcohol and the attacks. “We will do everything possible to bring the full weight of the law to bear on anyone who attacks our staff. Balance Director Colin Shevills added: “It’s outrageous that paramedics don’t feel safe in their working environment as a result of other people’s alcohol misuse. “These are people who are there to help us when we need it most, yet they are living in fear of physical and verbal abuse on a daily basis. “Our relationship with alcohol is out of control. We need to bring it under control by making alcohol less affordable, available and less widely promoted. Wednesday 19th August 2015 – 6.45am – John Hawker. 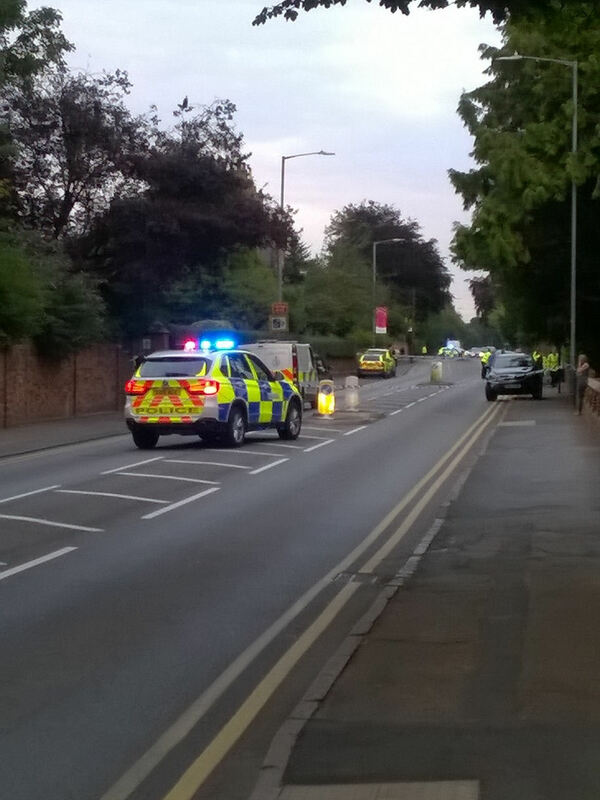 A pedestrian had been seriously injured following an RTC in Warwickshire last night. 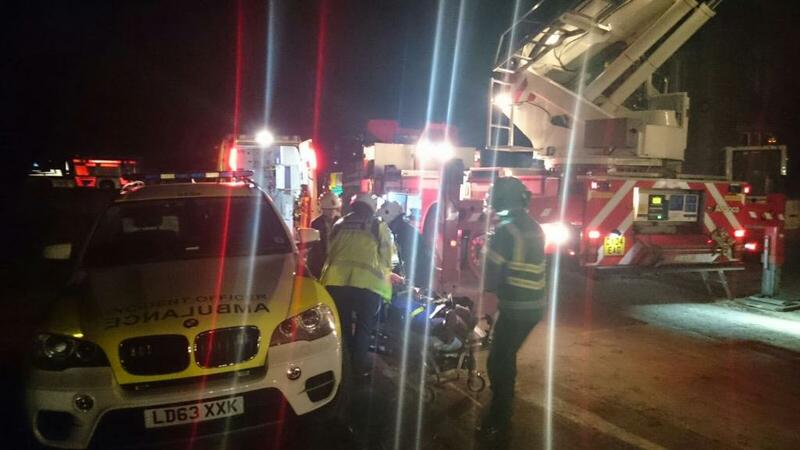 The incident occurred on the A46 flyover, over the M40 from Sherbourne towards Coventry at around 10.05pm. An ambulance, a paramedic officer and the WNAA BASICS car with two doctors on board attended the scene. A West Midlands Ambulance Service spokesman said “Crews arrived to find a man who had been struck by a car and suffered multiple serious injuries. “The man, believed to in his 30’s, received emergency treatment at the scene from medics for serious leg fractures and suspected pelvic injuries. “The man was administered with pain relief and due to his injuries was sedated at the scene. “Once his condition was stabilised he was transferred by land ambulance to University Hospital Coventry and Warwickshire for further emergency treatment and a trauma team were awaiting his arrival. Tuesday 18th August 2015 – 3.15pm – John Hawker. A woman who fell whilst rock climbing in the Malvern Hills was rescued by the Trusts Hazardous Area Response who happened to be close by taking part in a training exercise with the Fire Service. The incident occurred at an area known as Tank Quarry at around 11.10am. A West Midlands Ambulance Service spokesman said: “A team of staff from the Trusts specialist Hazardous Area Response Team were in the Malvern Hills on a pre-arranged training exercise with the fire service. “Just as they were about to start they were alerted to an incident nearby and were told a woman was injured after falling down a steep rock face. “The emergency service staff immediately made their way to the location which was about 20 metres away from where they were. They found a woman, believed to be in her mid 20’s, who had fallen down the cliff face of around 15 metres and was lying in undergrowth at the bottom. “She was immediately treated by paramedics at the scene and with the help of the fire service was rescued from her precarious position. The woman was treated for back and neck pain and was also given pain relief. “An ambulance was asked to attend the incident and the patient was carried down to the nearest point it could access. “Ambulance and fire service staff worked seamlessly together at the scene to ensure the patient was rescued as quickly and safely as possible. The woman is fortunate that they were already extremely close by at the time on a training exercise. Tuesday, 18th August – 10.45am – Jamie Arrowsmith. Ahead of thousands of music lovers heading to Weston Park, final medical preparations are being made in readiness for this week’s V Festival. The popular annual festival is again expected to draw big crowds with tens of thousands attending each day, many of whom will be camping throughout the weekend. 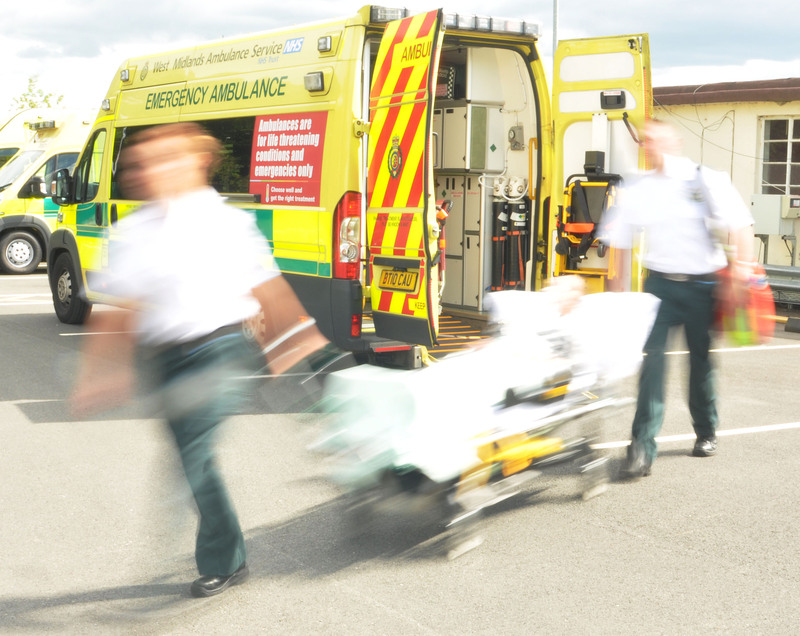 Once more, West Midlands Ambulance Service (WMAS) will be working in partnership with Venture Event Medical Management and St. John Ambulance to ensure first-class medical services are available in order to make it one of the safest festivals in the country. Last year, approximately 870 patients were treated for a variety of injuries, 20 of whom required transporting to hospital. In total there will be approximately 200 staff and volunteers working throughout the weekend. A command and control centre will be set up on site, staffed by call takers and dispatchers who will co-ordinate ambulances and medical staff who will be stationed within the park. Self-contained medical centres staffed by doctors, nurses and staff from St. John Ambulance will also be present on site and are fully equipped to deal with all types of injuries, helping festival goers to avoid any unnecessary trips to A&E and continue on with their fun at the festival. 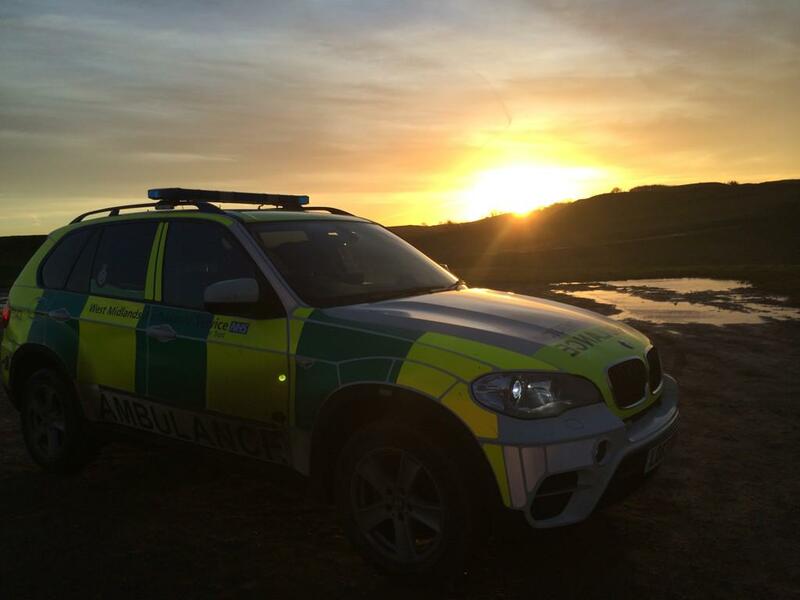 The ambulance service will be taking its own advice and will be prepared for all weather conditions; alongside our ambulances, we will be deploying a number of 4×4 vehicles which will help staff gain access to people who may become injured in any difficult locations during the event. Throughout the course of this week and over the weekend, WMAS will be running a safety campaign offering tips and advice on how to make sure visitors are fully prepared and stay safe throughout the festival. Early indications suggest the weather will be incredibly mixed, visit http://www.metoffice.gov.uk/events/v-festival-weston-park for the very latest forecast. As a result of the expected changeable conditions, Assistant Chief Ambulance Officer Steve Wheaton, has offered the following advice to festival goers. “We are urging people to follow a few simple tips over the weekend’s event to ensure they get to spend their time in the music tent rather than the medical centre. “Over the years I have encountered huge variations in the weather throughout festival events. Savvy festival goers will bring waterproof clothing, such as a rain coat, their wellies and sensible footwear to help avoid any unnecessary slips and falls, as well as some sun cream and a hat should the sun decide to shine over the park. “The festival is fun and good natured and overall has a history of being a very safe event. Every year we will see a handful of people over-doing it on the first night and sadly having to go home early, missing the entire festival. Therefore it is important that people are sensible with their intake of alcohol and I would advise people to drink plenty of water and soft drinks to avoid dehydration and please don’t forget to eat regularly. 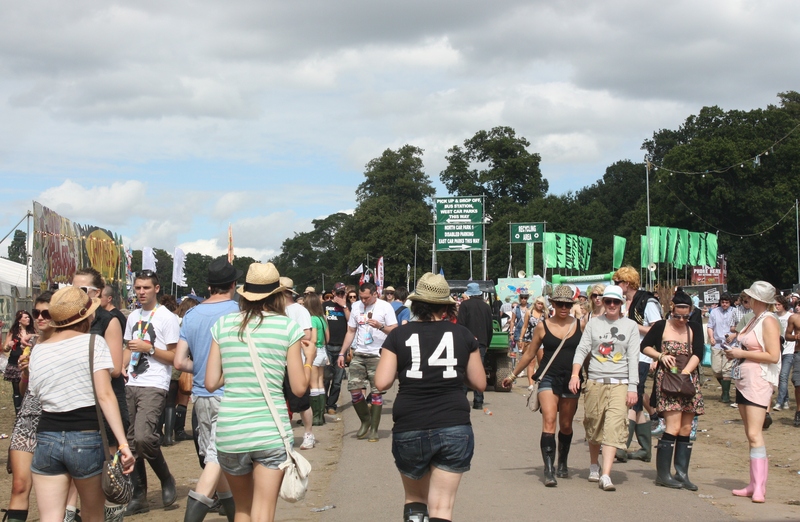 Jon Mannion, the event manager for St John Ambulance, said: “V Festival is one of the biggest first aid operations of the year for St John Ambulance in the West Midlands. “We will be providing a team of healthcare professionals, ambulance crews, first aiders and support staff as part of the medical provision on site. Tuesday 18th August 2015 – 10.30am – John Hawker. 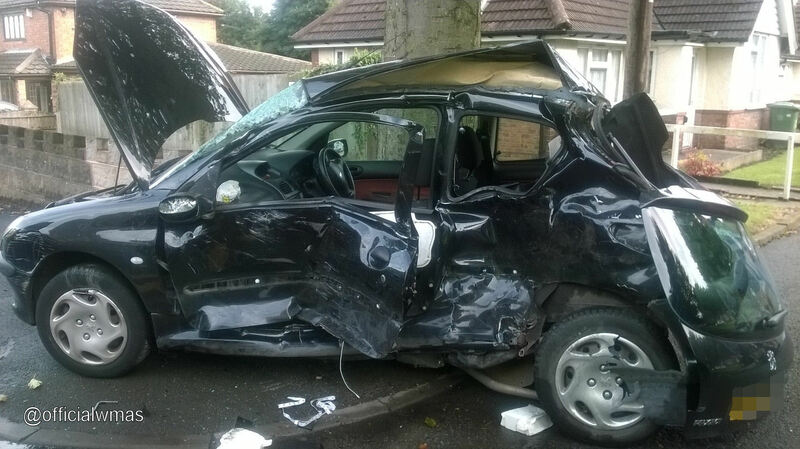 The driver of a car has been lucky to escape serious injury following a RTC in Warwickshire this morning. The incident happened on the A3400, Wootton Wawen, Henley in Arden at around 8.40am. A West Midlands Ambulance Service spokesman said: “Crews arrived to find a car that had left the road and rolled over. It had also demolished a lamppost and come to rest on its roof on a grass verge near a hedgerow. “The woman driving the car was trapped in the vehicle as the door was damaged and unable to be opened. “The woman, believed to be in her 50’s, received treatment and reassurance at the scene as the fire service opened the door so she could get out of the vehicle. “Following a full assessment by medics the woman was discharged and did not need to go to hospital. One land ambulance, a rapid response paramedic and a paramedic officer attended the scene. Tuesday 18th August 2015 – 6.45am – Murray MacGregor. 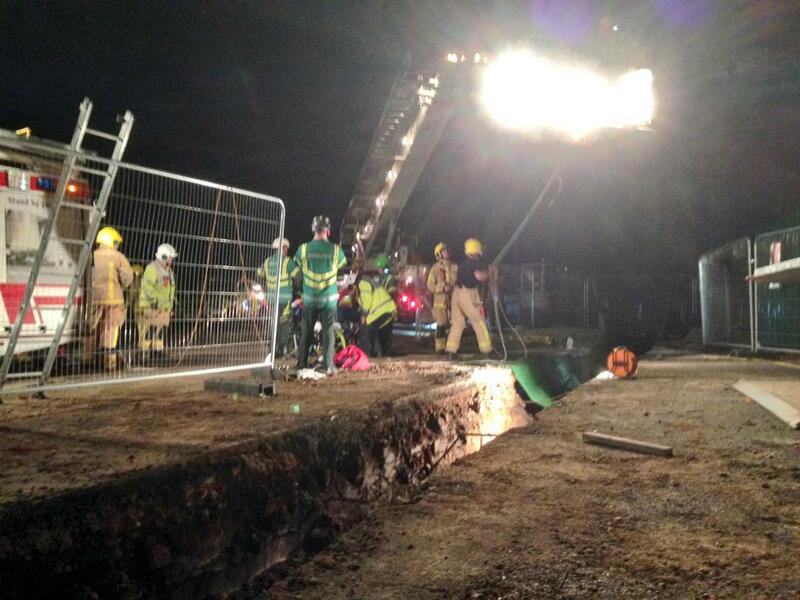 A man who was trying to take a short cut has ended up needing rescuing after falling into a four foot deep trench. An ambulance, a paramedic area support officer and the Hazardous Area Response Team (HART) were sent after a call at 11.50pm on Monday evening. 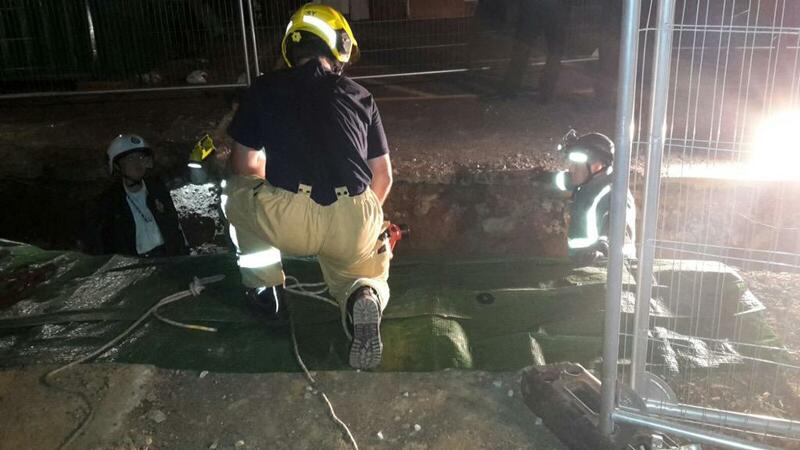 A West Midlands Ambulance Service spokesman said: “The man, who was in his 50s, was at the bottom of the trench which was about shoulder width across with a potential fracture to his ankle and was unable to move. “The HART team and Shropshire Fire and Rescue Service were both called to the scene due to the risk of the trench collapsing. “The ambulance crew splinted his leg and ankle while the HART paramedics worked with firefighters to prepare to lift the man. 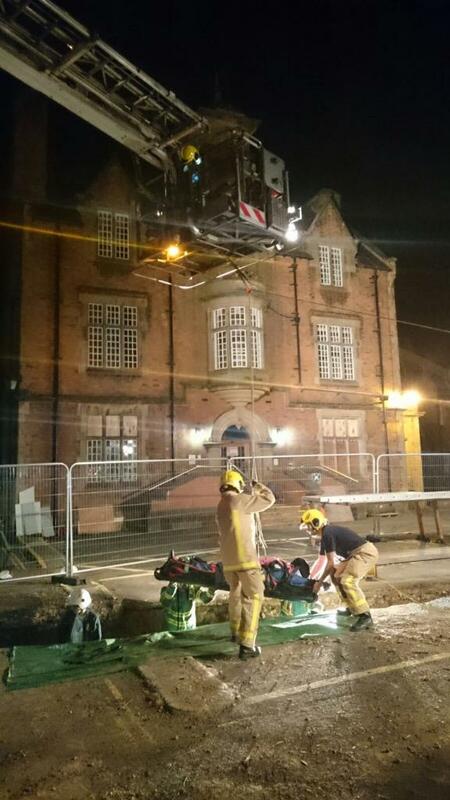 “He was placed onto a specialist stretcher and was then lifted using an aerial ladder platform. “Once out, his treatment continued on the ambulance before being taken to Royal Shrewsbury Hospital for further assessment. Tuesday 18th August 2015 – 6.00am – Murray MacGregor. A young woman pedestrian has died after a collision with a car on a busy road. The crash happened at about 9.15pm on Monday evening outside Trinity Point, by the crossroads on West Street in Coventry. A West Midlands Ambulance Service spokesman said: “When crews arrived, they found a young woman who had been in collision with a car. “Sadly, she had suffered very serious injuries. “Ambulance crews battled to stabilise her condition before taking her on blue lights to the major trauma centre at University Hospital Coventry & Warwickshire. “Tragically, it soon became apparent that nothing could be done to save her and she was confirmed dead shortly after arrival. Monday 17th August 2015 – 11.12pm – Murray MacGregor. A middle aged cyclist has been airlifted after his head hit the windscreen of a car. The man was riding along Hillmorton Road in Rugby at just after 7.00pm on Monday evening when the collision happened. 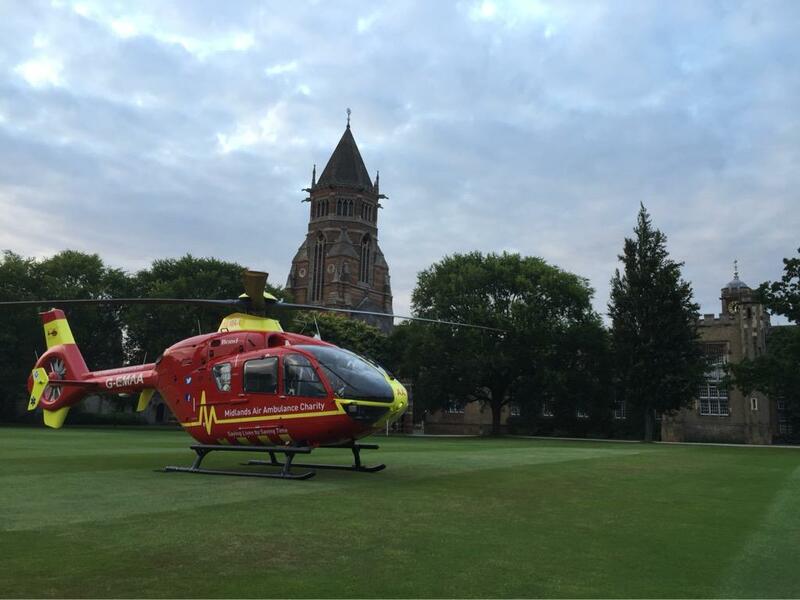 A paramedic on a rapid response vehicle was very quickly on scene and was backed up by an ambulance, a paramedic area support officer, the MERIT Trauma doctor and the Midlands Air Ambulance from Staffordshire which landed in the nearby Rugby School. A West Midlands Ambulance Service spokesman said: “On arrival, the cyclist was unconscious and appeared to have a serious head injury. The car windscreen had suffered considerable damage in the collision. “The man was assessed and treated at the scene by ambulance staff but his condition started to improve and he regained consciousness. “He was airlifted to the major trauma centre at University Hospital Coventry & Warwickshire in a flight that lasted just four minutes. Monday 17th August 2015 – 6.45pm – Murray MacGregor. Two women have escaped serious injury despite a two car collision that left one car on its roof and a lamppost that had been moved by almost a foot by the force of the collision. 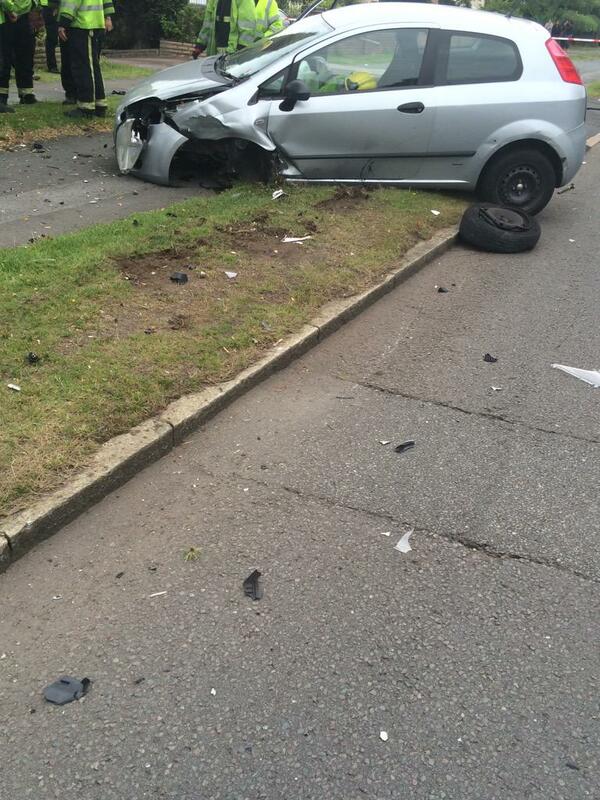 The crash in Chester Road in the Erdington area of Birmingham happened at about 5.30pm on Monday afternoon. 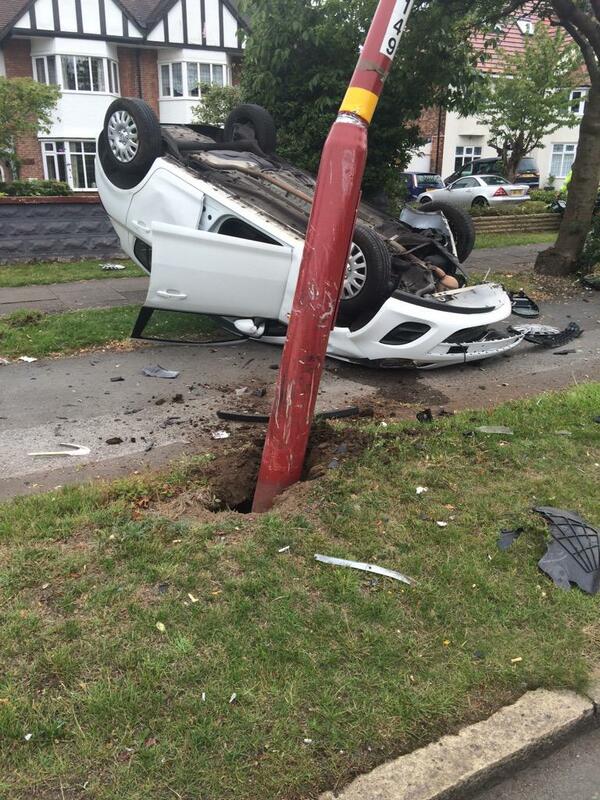 “The white car was upside down, but passers-by had helped the driver out of the vehicle. The woman, who was estimated to be in her 40s had a head injury and abrasions to her arms from the broken glass. She was assessed at the scene before being taken to Good Hope Hospital. “The woman in the grey car, who was a similar age, had a head injury after hitting her head on the windscreen. She also had superficial burns to her arms from the airbags deploying. She was immobilised using a neck collar and spinal board, before being taken to the same hospital. Monday 17th August 2015 – 5.35pm – Chris Kowalik. 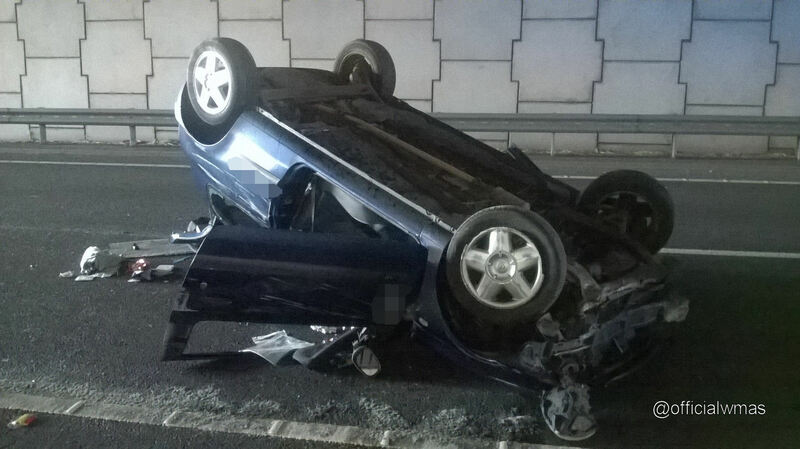 A man was trapped in his car after it overturned and ended up on its roof in Coventry. West Midlands Ambulance Service was called to Four Pounds Avenue shortly after 3.45pm today. Two ambulance crews, a paramedic area support officer in a rapid response vehicle and the Warwickshire and Northamptonshire Air Ambulance attended. A West Midlands Ambulance Service spokesman said: “The driver, a man who is in his seventies was trapped for a short while. He had a suspected broken arm and a cut to an arm. He was immobilised and was taken to University Hospital Coventry and Warwickshire. “His front seat passenger, a woman in her seventies had neck pain and was taken to the same hospital for precautionary checks. Monday 17th August 2015 – 8.30am – Chris Kowalik. 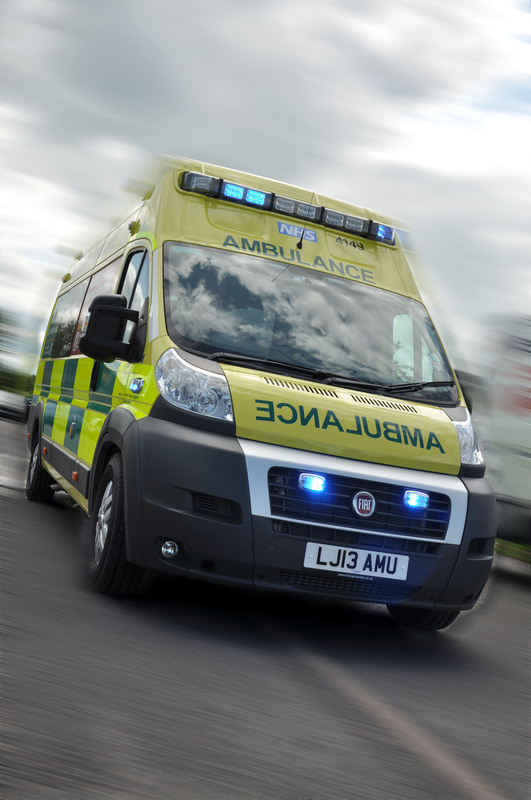 A man was seriously injured last night when his car overturned in the Black Country. West Midlands Ambulance Service was called to Dudley Road East in Oldbury shortly before 11.25pm yesterday. An ambulance crew, a paramedic area support officer in a rapid response vehicle and the MERIT trauma team consisting of a trauma doctor and critical care practitioner attended. Police and the fire service also attended. 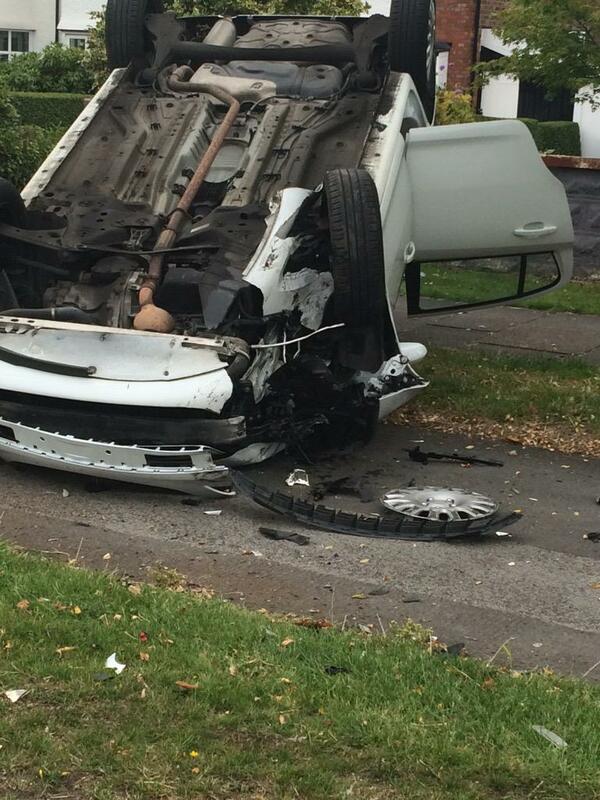 A West Midlands Ambulance Service spokesman said: “The car reportedly ‘cartwheeled’ several times before coming to rest on its side (pictured). “Before its driver, a man in his twenties, could be freed from the car, it had to be stabilised by the fire service. “He was removed from the car with the use of a long spinal board before being transferred to a scoop stretcher. He was assessed by the attending trauma doctor. He had a bad cut to his face, a thigh wound, a suspected broken ankle and suspected spinal injuries. 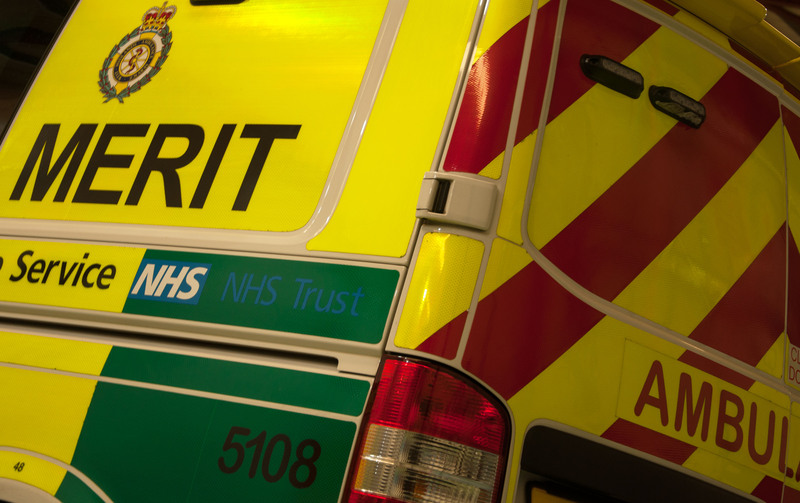 A man and a woman were immobilised and taken to hospital after the car they were in overturned on the M6 in north Warwickshire. West Midlands Ambulance Service was called to the southbound carriageway between junction 2 and 1 shortly after 11pm yesterday. Two ambulance crews, an advanced community paramedic in a rapid response vehicle and a paramedic area support officer in a rapid response vehicle attended. A West Midlands Ambulance Service spokesman said: “The driver, a man believed to be in his twenties had back, neck and arm pain. He was immobilised with the use of a spinal board and neck collar and was taken to University Hospital Coventry and Warwickshire. Sunday 16th August 2015 – 7.50pm – Chris Kowalik. 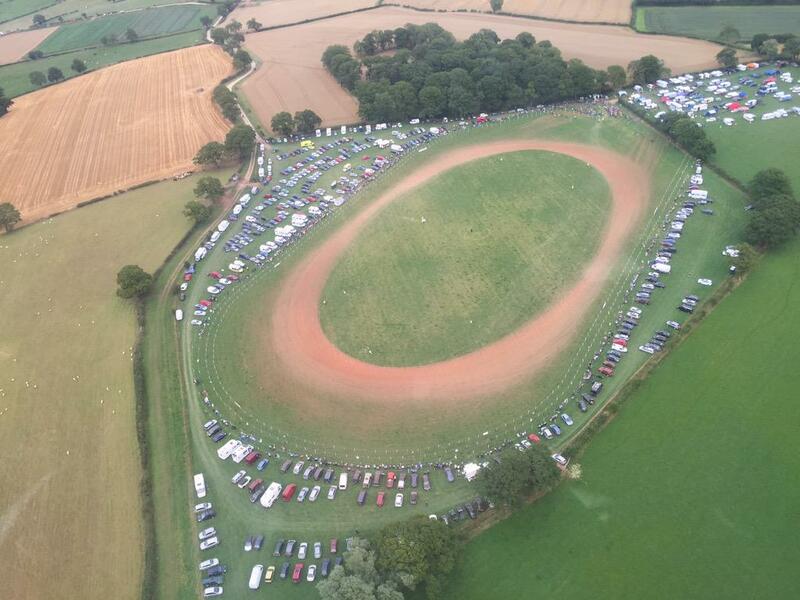 A man who fell from his motocross bike at an event in Herefordshire has been taken to hospital. 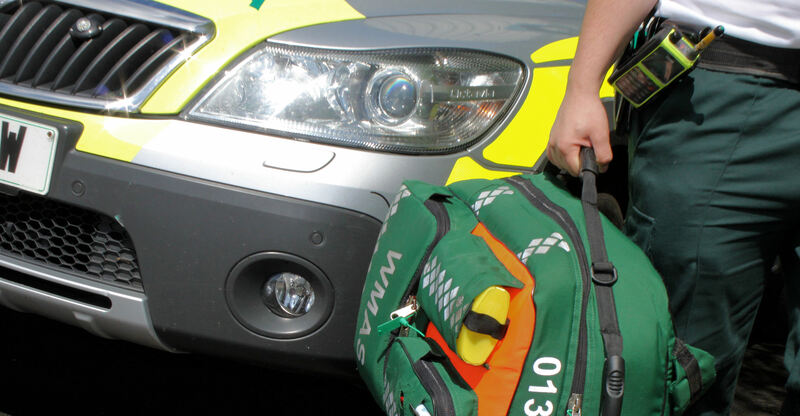 West Midlands Ambulance Service was called to a farm in Pencombe shortly before 2.30pm today. A West Midlands Ambulance Service spokesman said: “The man who is in his twenties had fallen from his bike and it is believed he was initially briefly unconscious. “Although he appeared uninjured, he later developed back pain and a sore wrist and was nauseous. He was treated at the scene for his conditions including pain relief and anti-sickness drugs. Sunday 16th August 2015 – 5.30pm – Chris Kowalik. 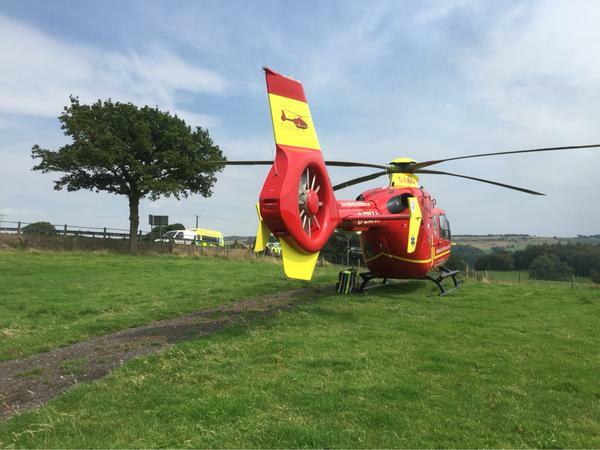 A woman who landed on her head after falling from a horse in north Staffordshire has been flown to hospital. West Midlands Ambulance Service was called to woodland near the Ramblers Retreat in Alton shortly before 11.55am today. Community First Responders, an ambulance crew and the Midlands Air Ambulance from Staffordshire attended. A West Midlands Ambulance Service spokesman said: “The nearest the land ambulance could get to her was one mile away and the crew had to walk the rest. It’s for that reason that the Midlands Air Ambulance was called for. Pictured above: Midlands Air Ambulance from Staffordshire waiting nearby. Sunday 16th August 2015 – 5.15pm – Chris Kowalik. 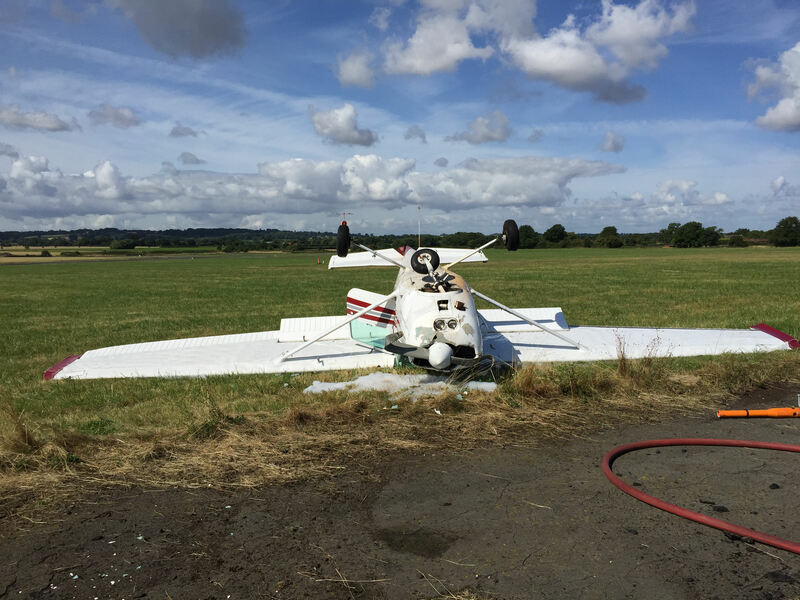 A pilot whose light aircraft landed upside down, got out uninjured. West Midlands Ambulance Service was called to Wolverhampton Halfpenny Green Airport shortly after 10.25am today. An ambulance crew, a paramedic area support officer and the Midlands Air Ambulance from Cosford attended. Sunday 16th August 2015 – 10am – Chris Kowalik. A stock car racing driver had back pain after a crash at an event in Coventry. West Midlands Ambulance Service was called by Warwickshire Fire and Rescue Service to Brandon Stadium shortly before 9.20pm yesterday. A West Midlands Ambulance Service spokesman said: “The man who is in his sixties had back pain. He was freed with the help of the fire service.